I’m a traileur at heart so I don’t race on the road very often, in fact I find it pretty tedious and gave up aiming for a sub three-hour marathon a couple of years ago when I saw that the extra effort involved just didn’t seem to pay off, and training on the road meant I spent more time away from the trails. 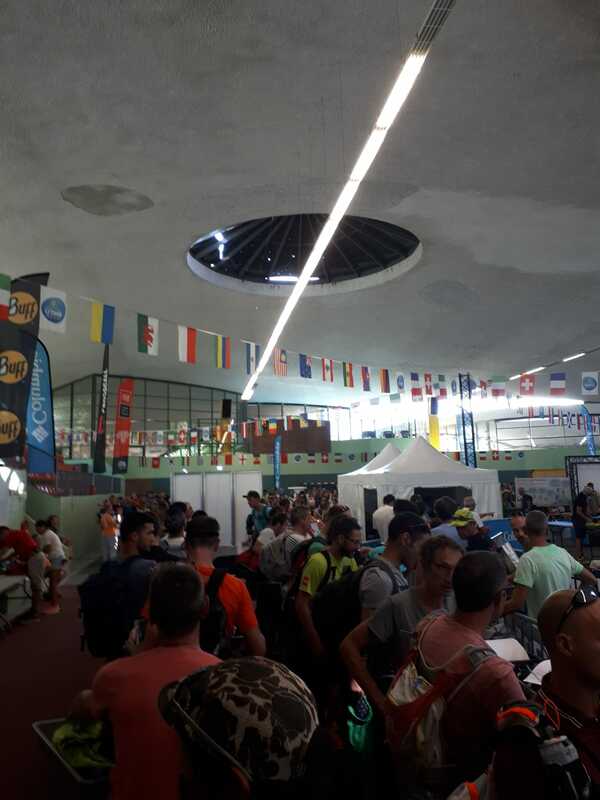 Collecting bib numbers at the Sports Hall in Parc Paul Mistral, Grenoble. 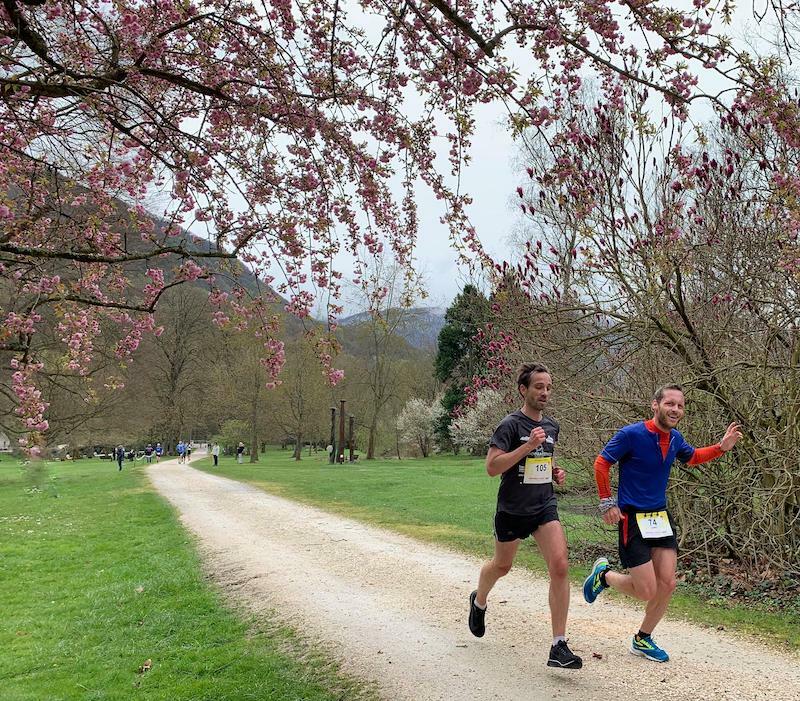 However, there’s a lot to be said for running at high intensity on hard surfaces occasionally, making gains you just don’t get running on varied off-road, mountainous terrain so I decided to run the Grenoble-Vizille 22km road race. I wouldn’t say I was aiming for this as just a ‘training race’, but I did enter it to mainly force myself to go through a high intensity workout that I would find hard to maintain when training on my own. My secondary goal was to beat 1hr30 in what was 900m further than an official half-marathon. 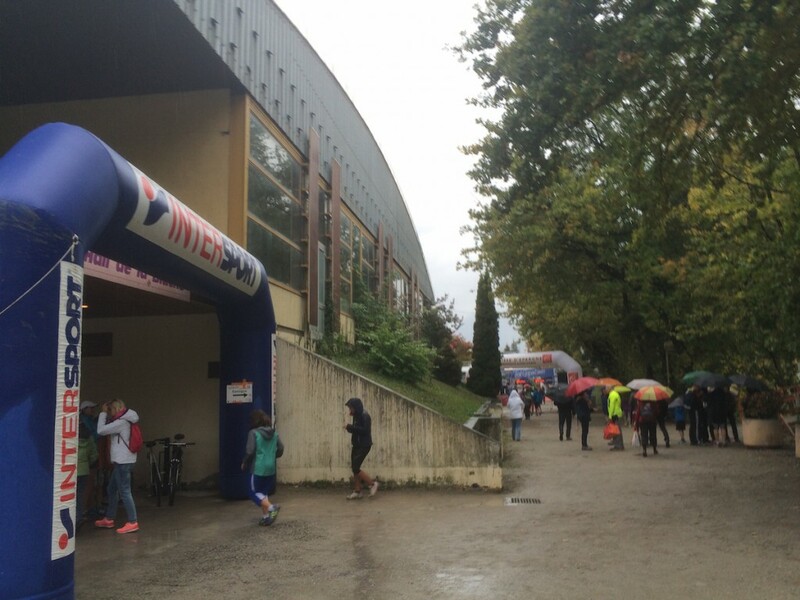 The event attracts nearly 2,500 runners every year with a variety of way of running the point-to-point 22km from Parc Mistral in Grenoble, south to the historic Château in the town of Vizille. 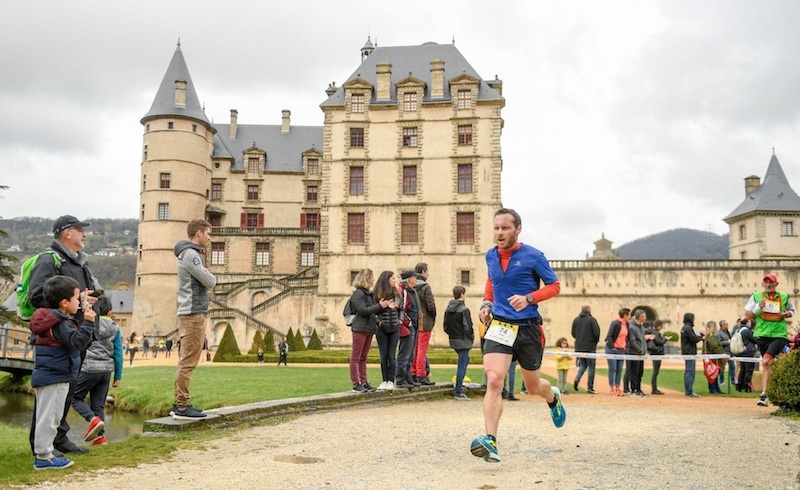 Solo runners complete the whole 22km, but there are competitors who run as a relay in teams of two or four, and even several ‘rando’ courses with walkers setting off early on the course to reach the château at a more leisurely pace. Although Grenoble is surrounded by imposing mountains on all sides, it is actually one of the flattest cities in France which means that the first few KMs out of the city, on closed roads were exceptionally fast, by my standards at least. Cheered on by surprisingly decent crowds of locals braving the Sunday morning drizzle we left the city limits on country roads and after the 4km mark hit the dreaded 300 vertical metre climb for the next 6km up to the nearly halfway point. Normally I wouldn’t blink at the concept of climbing 50m per KM, but when you’re running at half marathon pace on paved roads, and you can see those roads stretching out and climbing into the distance it becomes quite a physical and mental challenge. The plan was to hang on and limit my losses and as the kilometres ticked by, my average pace continued to drop, but I was fairly confident I’d banked enough fast kilometres early on to be able to absorb them. 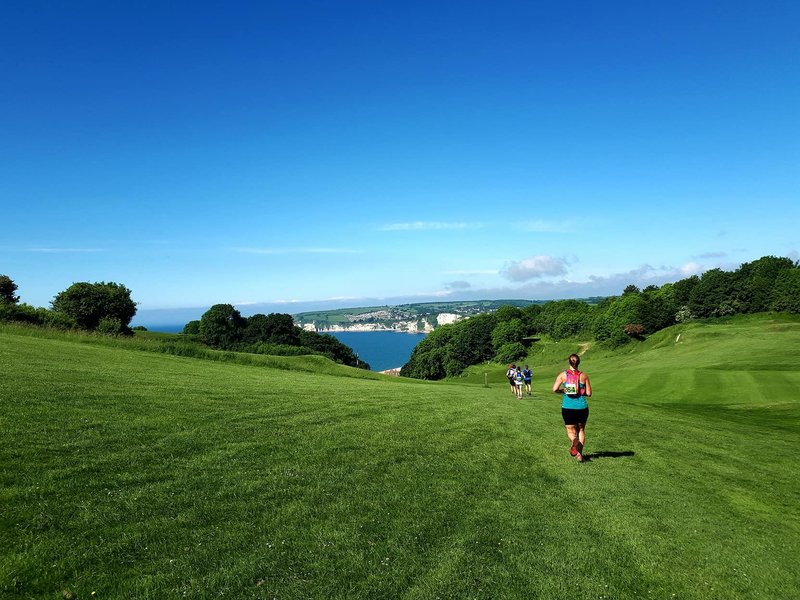 My hill training seemed to help as well as although the pace slowed, I found it quite comfortable to settle into a rhythm at a slower speed and I passed lots of faster runners who were obviously struggling with the gradient. Over the top of the hill I knew that it would be mostly downhill from there and the pace did pick up agian, but with 6-7km to go I could feel myself starting to flag. I hadn’t packed any gels, but had managed to find a couple of energy bars in the supermarket the night before. I had resisted eating any so far because at the effort I was maintaining trying to chew solid food was going to slow me down and I thought I could hang on until the end. I knew I’d have to take on a few calories though so nibbled on a few bites, while losing a few places to runners from behind as I struggled to gasp more air into my lungs and swallow the food at the same time. Inevitably my pace for the last 4km stayed above the 4min/km mark but as I passed the 21.1km (half marathon mark) I noted that 1hr 26min 15s was a new PB, even though I’ve still never officially run a half marathon distance apart from on trail. 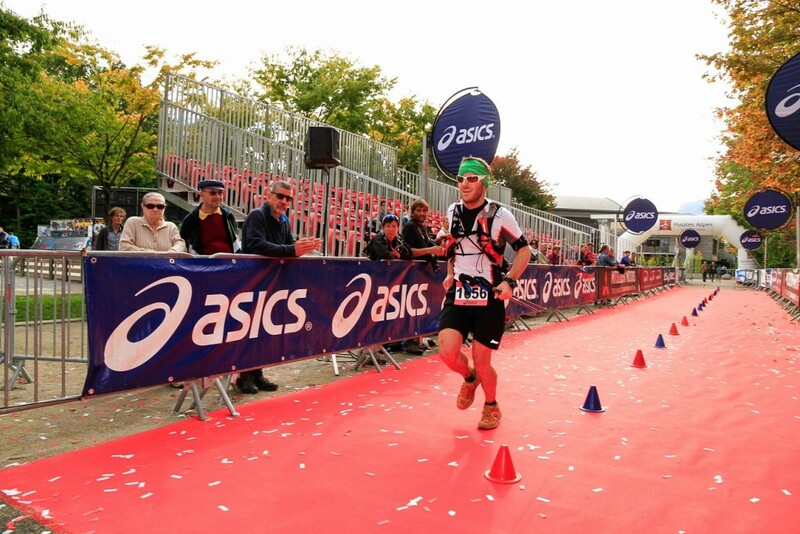 Finding the last reserves of energy on the last few hundred metres into the finish. My final hope was to finish the race in a sub 90 minute time and I knew it was possible but was going to be very close. 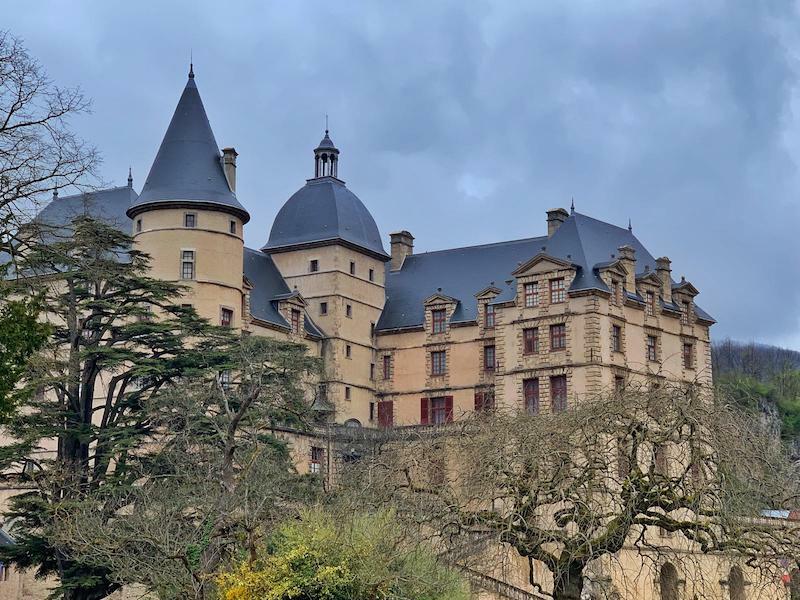 The final kilometre of the race runs through the beautiful gardens of the Vizille Château and there were lots of crowds gathered cheering us on, including Amy and her parents who I glimpsed in the last few hundred metres. As I turned into the finishing straight I could see the finish in the distance with the digital clock reading 1:29:55 – there was no way I could beat 90 minutes without a world record-setting final sprint, so I finally rolled over the line in 1:30:06, but was quite pleased with 39th place overall. Looking back on 2018 I’m very satisfied with what I’d class as a successful year. I avoid any serious injury, and completed my two main A races, including finishing my first ever 100 mile distance attempt. After finish the TDS in August, the autumn is always a time when I take it easy. Not only is it time to wind down after my main late-summer goal, but it’s also the start of the hunting season and my local trails become like a war zone where drunk, semi-literate blokes in orange-fluro take the edge off the fun of taking to the trails. I always like to pick a couple of short local races though to see out the end of the year, and this year I picked the FestiTrail d’Autrans. The main reason is that we’re in the process of buying a house in a village just down the road so I wanted to check out my new local running scene. The race is part of a large mountain film festival that takes place in the alpine village of Autrans. 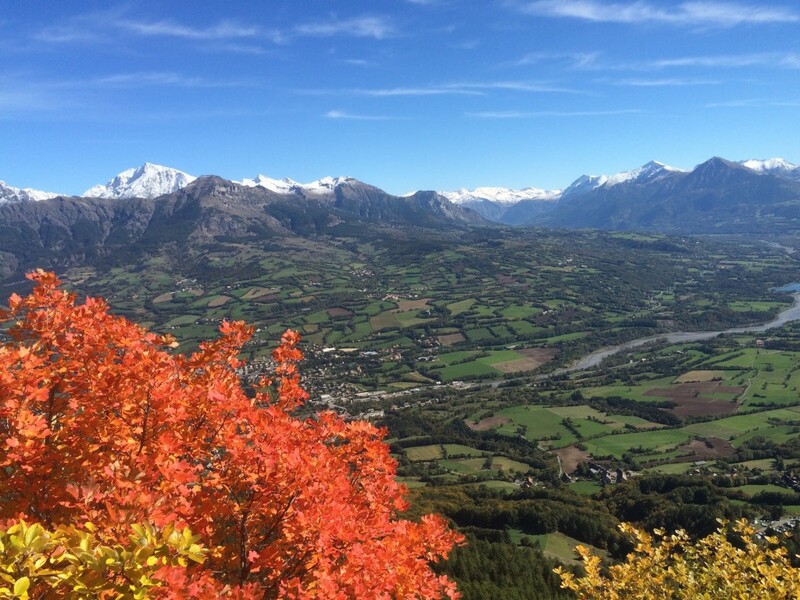 It’s part of the Vercors plateau and has it’s own ski area, including the ski jump used for the 1968 Olympics hosted by nearby Grenoble. The climb to the top of the ski jump is something I’ve know from previous ultras that have taken in the area, and we’d be climbing it again as part of this race. Early December is always a bit of a lottery in terms of snow cover, and this year the season has got off to a slow start. We’ve had a few dumps of the white stuff in the Alps but we’ve had long periods of cold, clear, anti-cyclonic weather which have kept the trails dry. 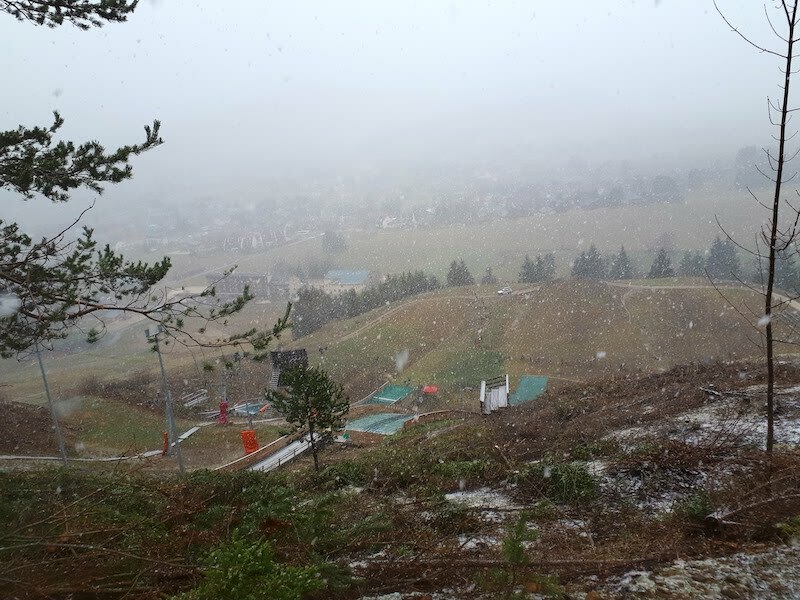 However the day of the race was hovering around freezing, with sleety snow falling for most of it which made the conditions slippery and muddy. 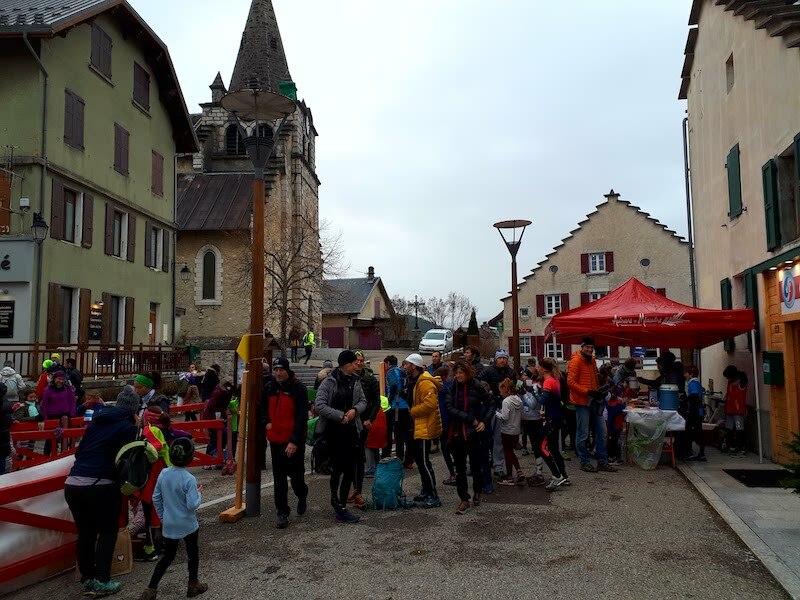 Although the weather was miserable if you weren’t running, the town was full of spectators and buzz, obviously helped by the wider festivities taking place. 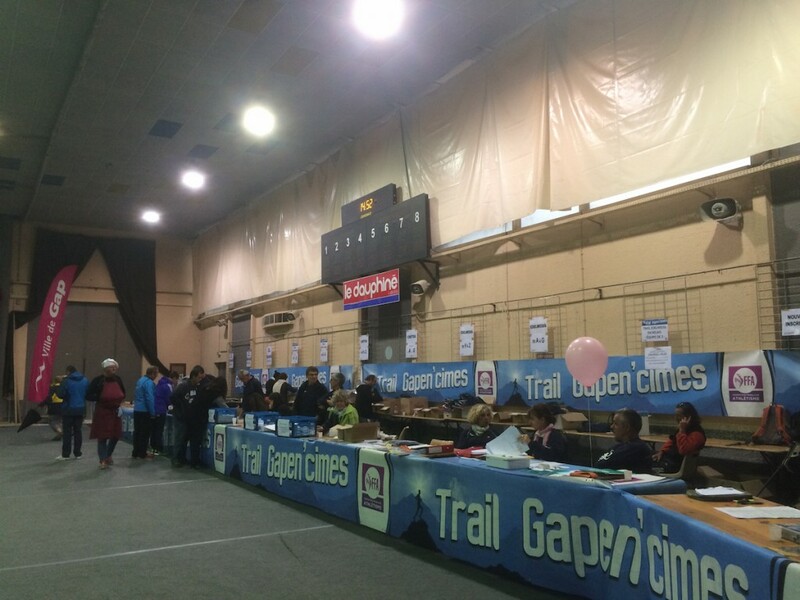 Registration took place in a large, well-heated sports hall and wasn’t as chaotic as usual despite several hundred runners. The race pack contained my bib, a good quality technical t-shirt and passes for the hot post-race meal, as well as free entry to the film screenings later that day. As well as the main 20km race, there was also a relay version of the race, with everyone running the first 7km which would loop back into town, and the relay racers would switch with their partners to run the remaining 13km. This made for a large mass start, with perhaps 500 of us heading out of town through the narrow streets. The organisers helped manage what could have been carnage by having us follow a car for 500m or so before being able to put the hammer down and run out of town. After a few KMs of running through boggy fields we reached the trail climbing up the ski jump, then a forest run down the other side. This set the tone for most of the race – lots of muddy snow and some slippy descents. 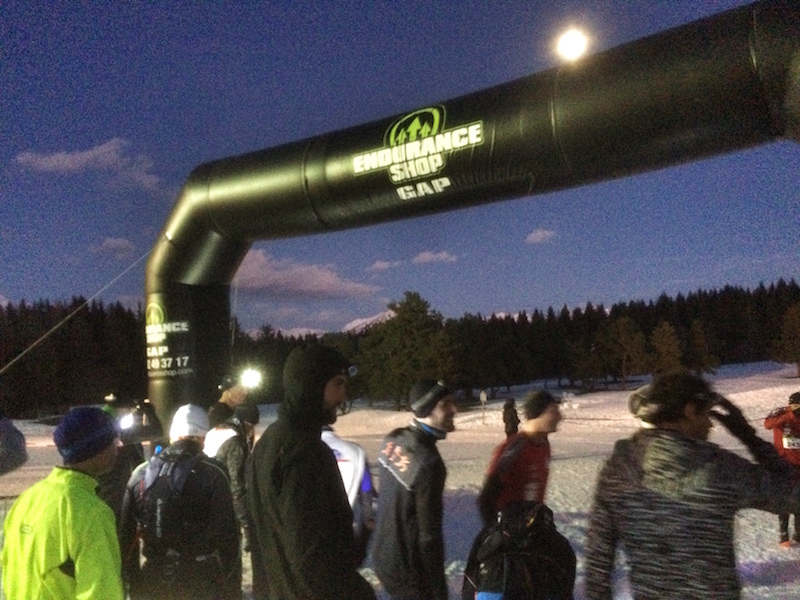 It was more like a British XC race than an Alpine race, but lots of fun. Running into the finish I was pleased to come in under two hours, giving me a position of 58th. I was hoping to place a bit higher but I guess I’m getting older and there’s lots of mountain goats running these races in the Alps. For the last couple of years I’ve been trying to acquiring enough points to enter the UTMB lottery. 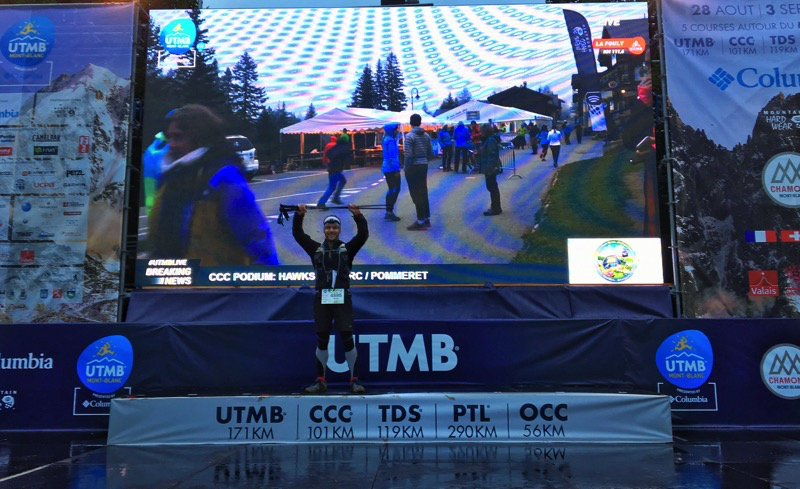 Last year I completed the 101km CCC, a hundred miler in the UK this summer, and the final piece of the puzzle was the 121km TDS – another of the UTMB events. 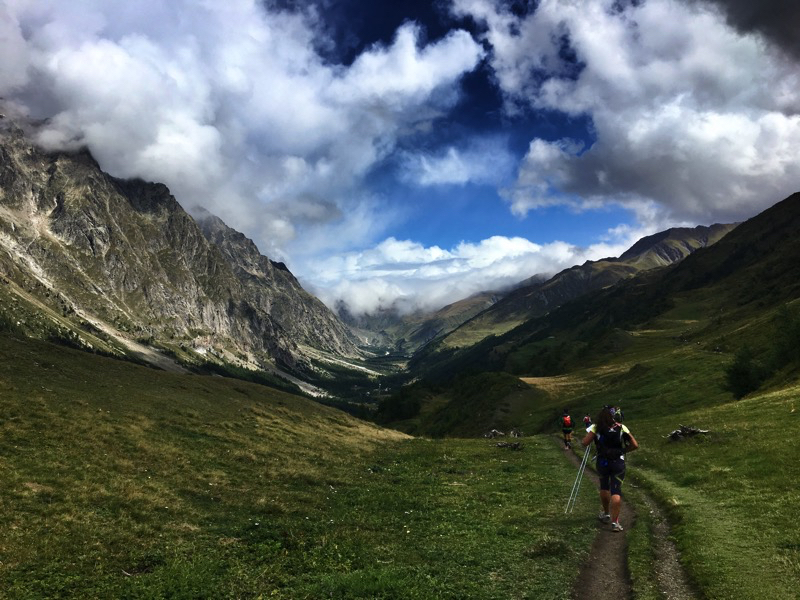 Naively, I assumed that at only 121km the Trail des Ducs de Savoie would be a nice intermediate step – a kind of apprenticeship to the UTMB. 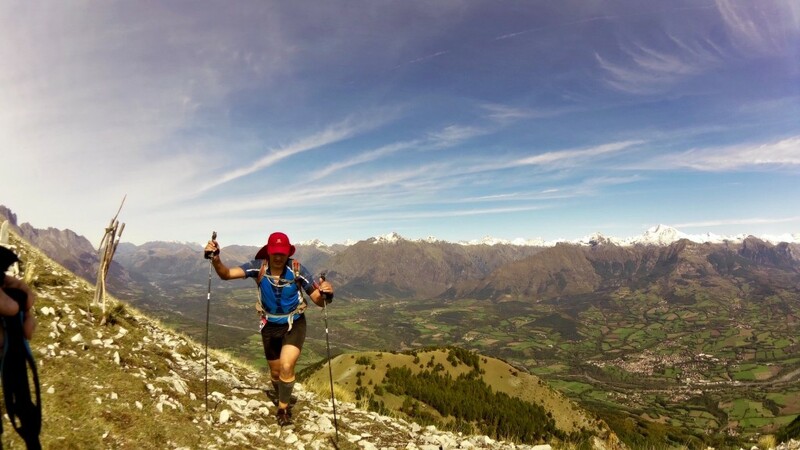 The race was introduced in 2009 and traces the Grande Randonée paths through the Aosta valley in Italy, and then the Beaufort, Tarentaise and finally Mont-Blanc valley in France. 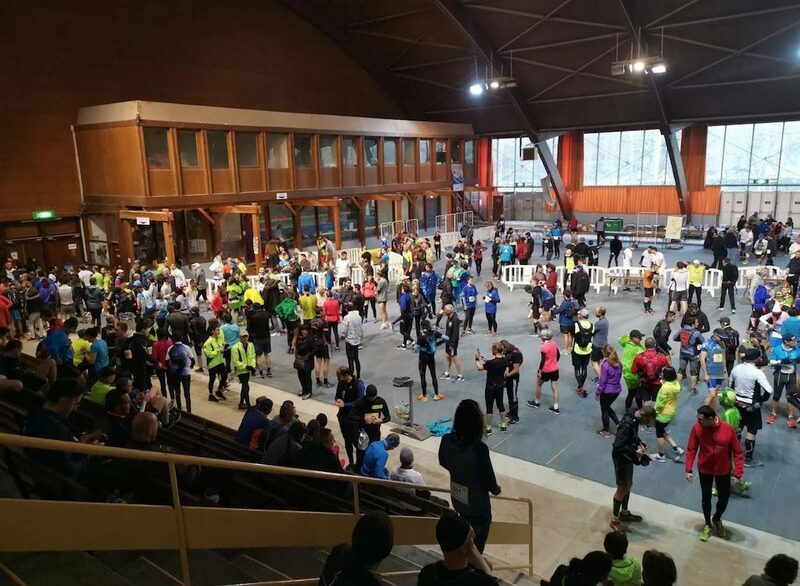 Chamonix heaving with the annual influx of trail runners, supporters and crews. 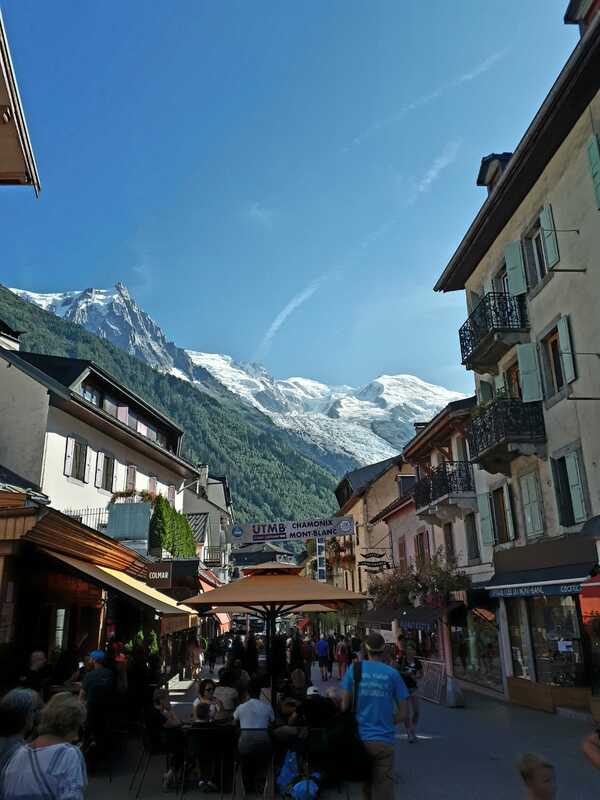 Amy and I drove up to Chamonix the afternoon before and checked into our apartment – it wasn’t the best facility but was at least only 5 minutes walk from the centre of town and the start/finish line. Registration and kit check passed without a hitch, although the queues were long so the whole thing took a good hour or so. Long lines at kit check – make sure you don’t forget anything. 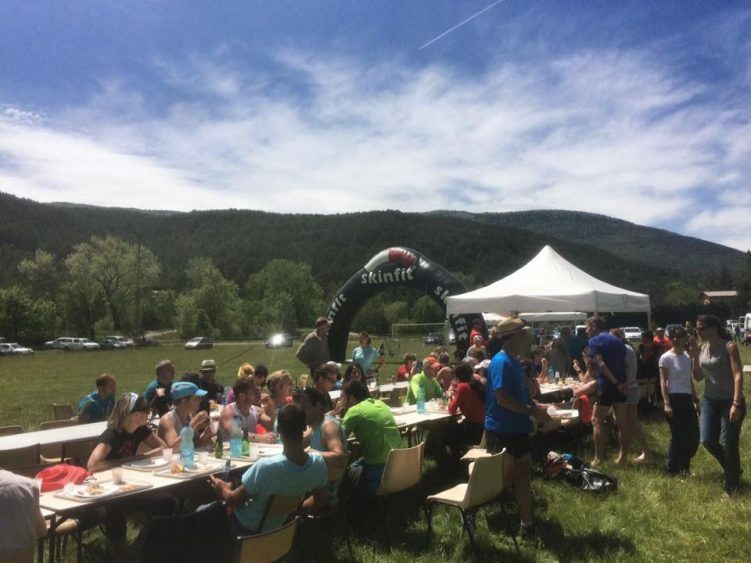 Despite the clear blue skies, blazing sun and warm temperatures, the race organisers were warning of poor weather the next few days and the mandatory equipment check was quite heavily geared towards ensuring we all had waterproof clothing and working mobiles. Back in the apartment, I got an automated text from the organisers that due to bad weather the race route would be modified and would start two hours later – at least I would get longer in bed; so with that in mind I did one final kit check and set my alarm for 5am. The next morning, the apocalyptic weather hadn’t materialised, and after the shuttle buses had deposited us on the other side of the Mont Blanc tunnel in Courmayeur and the sun came up, the warnings seemed even more overblown as we were treated to the start of a glorious day. However the last announcement before the start said that as soon as we hit the Col de Petit Saint Bernard and crossed into France, the weather would become decidedly less pleasant. The start was just like last year’s CCC – and the delayed start meant that more spectators were out to cheer us through the streets. The first trails we hit were quite wide and this meant that the usual bottlenecks you experience in mass start ultras weren’t really a problem. Over the course of 10km or so we climbed over 1000m before dropping down to Lac Combal. 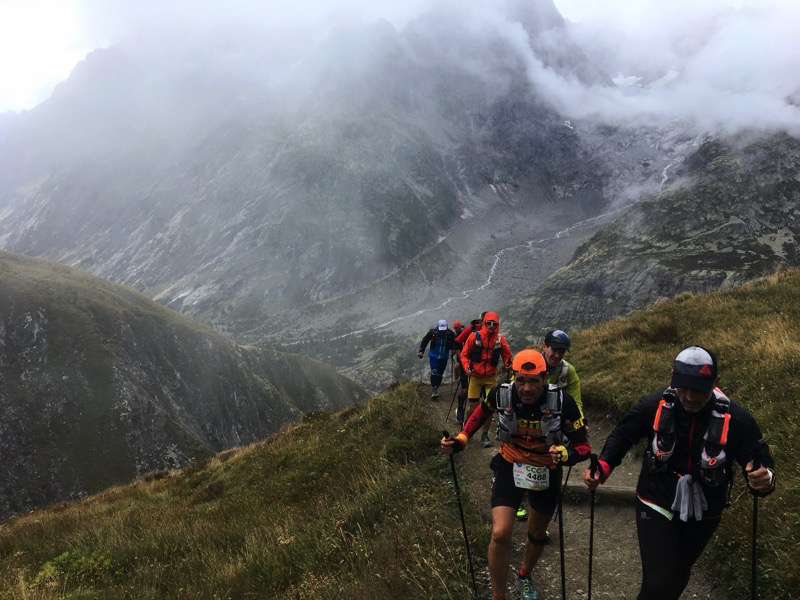 The terrain here was stunning – surrounded by glaciers and sweeping views I started to get an idea of why this course is well known for being more rugged and remote than its UTMB siblings. The early running in Italy was in perfect conditions. 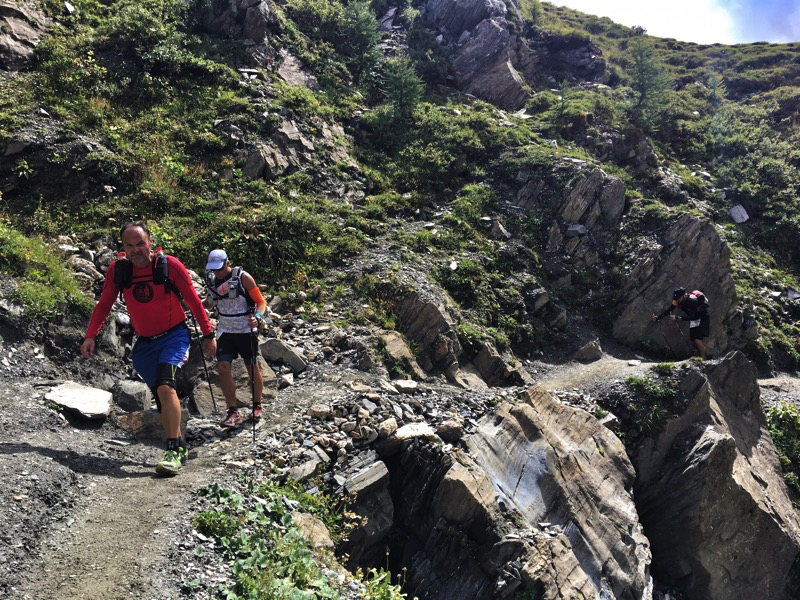 Running through the Italian Alps, surrounded by glaciers and alpine streams. 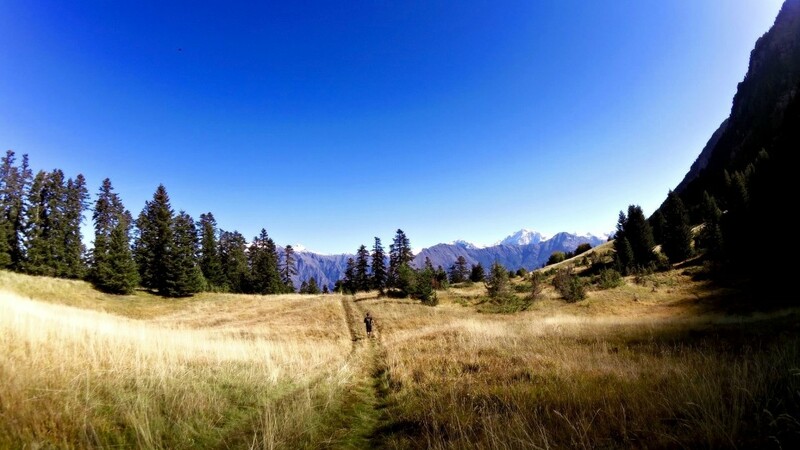 After leaving Lac Combal the hot sun and clear skies meant that I exhausted my water supplies quickly on the hard climb up to Col Chavannes, but dropping off the other side we descended a long 4×4 track which allowed me to effortlessly knock off 7-8km at 5:30min/km. I was a bit worried this was going too fast and I would pay for it later but it was great to get some distance under my belt. The race reflected in the calm waters of Lac Combal, as we approached the first checkpoint in the distance. The descent after Lac Combal was fast. Finally the rain came. 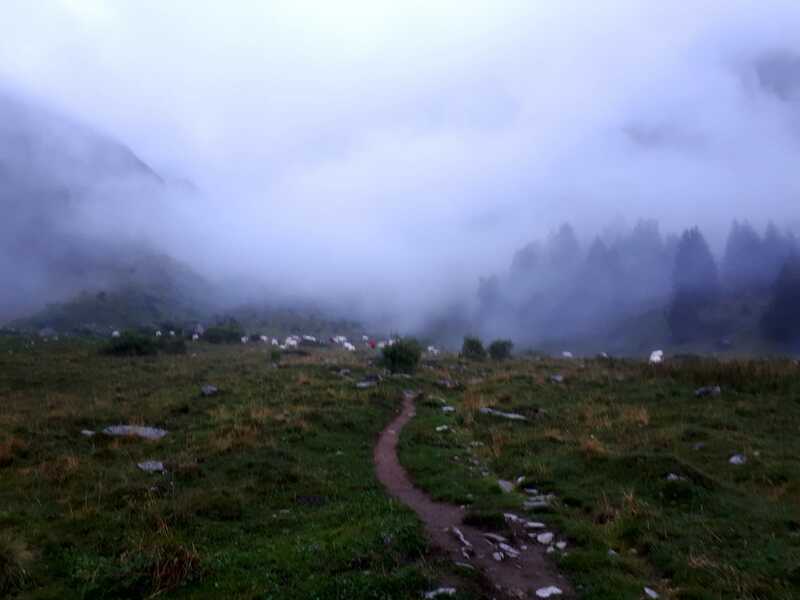 On the climb up to the Col du Petit Saint Bernard the clouds became more ominous and then suddenly, around 30 minutes from the next checkpoint the heavens opened and we were soaked by ferocious, driving rain. That mandatory kit came in handy as despite the waterproof jacket, gloves and hat, I was shivering by the time I got to the aid station which thankfully was serving hot pasta soup. Afterwards the descent into Bourg Saint-Maurice was a tough one – made all that much harder that we could see the town in the distance from a long way off so it seemed to take ages to arrive, but at least it was drying out and warming up. The checkpoint was heaving with people as it was the first point where outside assistance was allowed. I’d asked Amy not to come to the CPs because they were pretty remote, and I could rely on the drop bag at Cormet de Roselend instead. 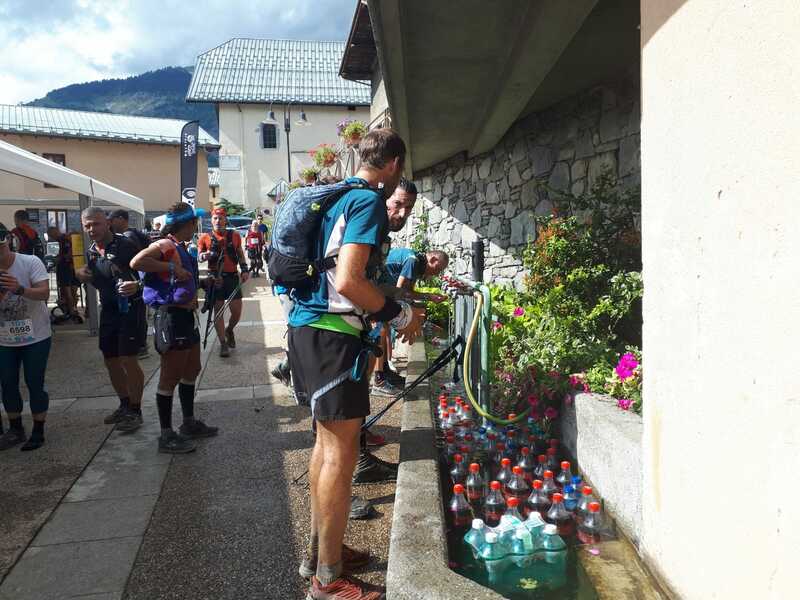 A very welcome water stop at Séez, after the long, hot descent towards Bourg Saint-Maurice. 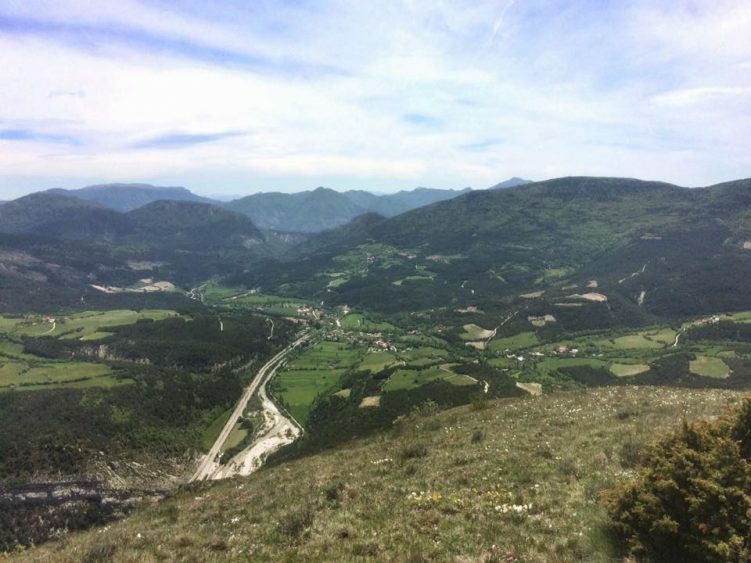 Every race report and review of the TDS I have read seems to have one thing in common – the climb out of Bourg Saint-Maurice and up to the Cormet de Roselend is steep and relentless. 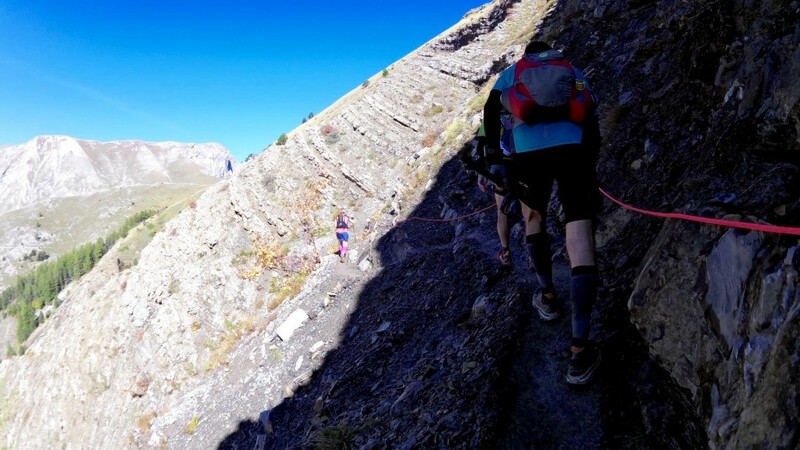 The almost 2000m of vertical in the late afternoon sun (for most of us) and with limited water opportunities this was something that loomed large on the profile map after relatively easy running of the first 50km. 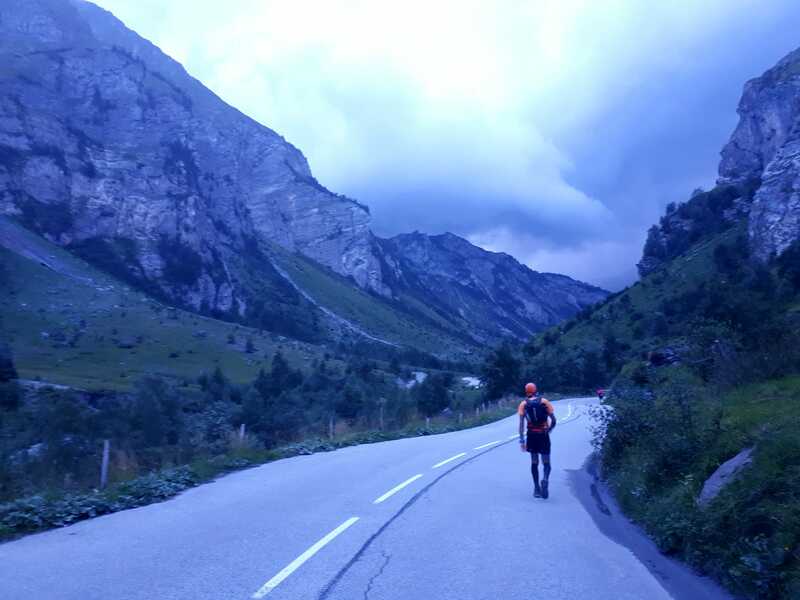 Our weather-affected route meant that the climb wasn’t constant, but instead it kept dropping back down, losing height and adding distance before eventually reaching the Cormet de Roselend after what seemed like an eternity. Cracks of forked lightning pointed the way we were headed as well as signalling the meteorological conditions that would be in store for us as night fell. A few KMs of the adjusted route to Cormet de Roselend were on tarmac, which just seemed to make the climb feel like it went on for even longer. 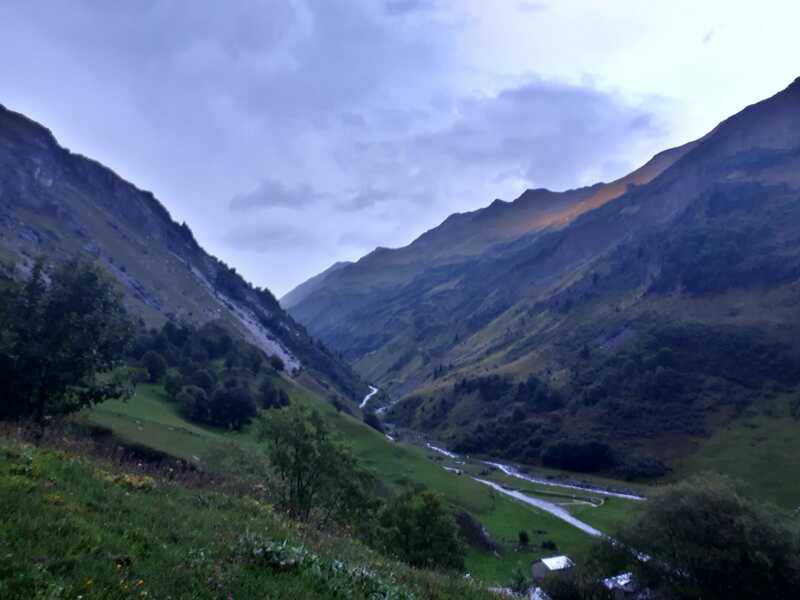 The last few minutes of daylight on the climb to the Cormet de Roseland – you can see what little sun that broke through the clouds shining on the mountain on the right. Cormet de Roselend was the first opportunity to access my drop bag, and I got changed into new layers and socks which gave more of a psychological boost than much else. I took on some soup and hot, sweet tea and had a ten minute doze on my backpack before heading back out into the night. More climbing – this time as the rain started to come down harder and the trails got higher and more technical, the pace slowed as we picked our way through the trails in the dark. 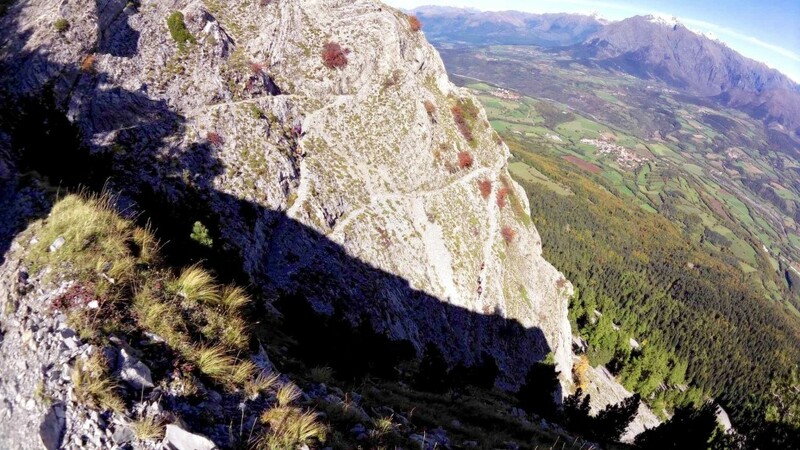 However going up was far better than the following descent down to La Gittaz. Rivers of mud, reminiscent of last year’s CCC meant we were slipping and sliding constantly. As we edged through a gorge we passed a blazing bonfire in the night, surrounded by a team of emergency service responders and it pretty soon became clear why they were stationed there as a precaution, as just further on we tentatively edged our way over wet, slippery rocks with a steep drop to a raging torrent on our right. Thankfully this was successfully navigated and we passed through the time check at La Gittaz where I followed the line of headlamps snaking up into the darkness towards Les 2 Nants. More slipping and sliding on the descent (can you spot a theme here?) towards the refuge at Col du Joly where the sound of Foreigner, wanting to know what love is, was blaring from the speakers to guide us in. Lack of sleep, fatigue, darkness and a thriving bar pumping out music up in the middle of nowhere contributed to the surrealism of the experience. The trails were becoming ridiculously slippery now and on the exit from the Col du Joly aid station I ended up sliding down the hill like I was Frank Spencer (if you’re not British from a certain era you will need to Google it) on roller skates – my trekking poles looped over my wrists didn’t help and I slid down on my back. Thankfully no major harm was done and soon the trail turned to more hard packed 4×4 track I was able to reach Les Contamines by around 5am. From here on I was sure I had this nailed. There was ‘just’ the Col de Tricot to pass and then it was more or less all downhill to Chamonix; in total no more than another 25km but encompassing another 1300m or so of climbing. The climb up to Tricot however was incredibly steep – although this had been the theme for the whole race, coming after 100km it was tough and people were dropping like flies, allowing me to make up nearly 50 places on this climb alone. More than once I was treated to a rendition of somebody vomiting into the undergrowth as I stood surveying the natural beauty around me. Half way up the brutal climb to Col de Tricot looking back down into the valley. After passing the Col the technical trails on the other side were fairly runnable as things were drying up and despite the heavy clouds it was shaping up to be a nice day in Chamonix. Passing the Nid de l’Aigle tramway I arrived in Les Houches where I really didn’t stay long – I’d been told it was 8km flat run into Chamonix and I was keen to get this done with. 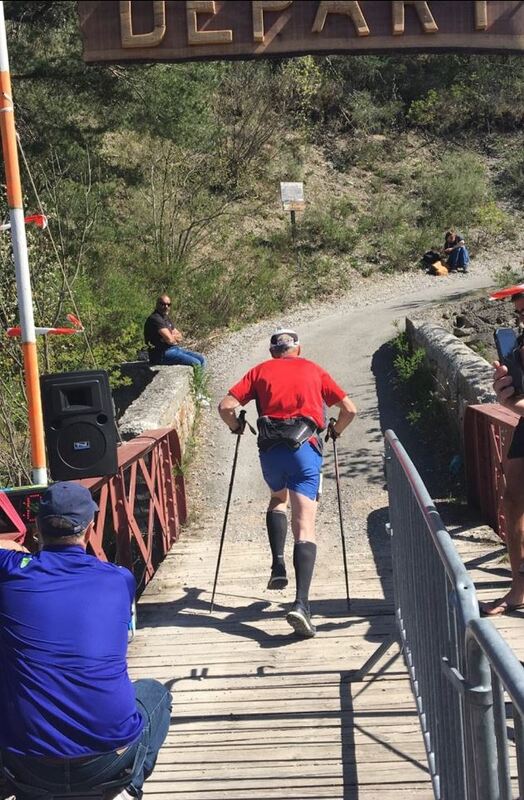 We had to cross the motorway via bridge to get onto the back forest track that led into Chamonix and after so long on remote trails it was amazing to be cheered and applauded by so many people on the streets. Nearly every car that went past would honk it’s horn which just helped add to the renewed enthusiasm. The back run into Chamonix was more ‘undulating’ than flat meaning a couple of sections were power-hiked but I managed to keep running for the most part and many others were finding the same second-wind. 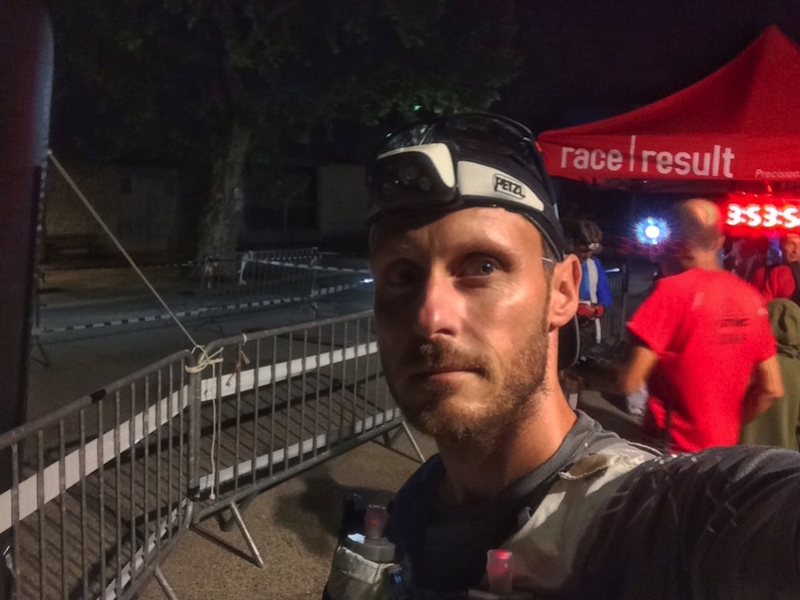 In fact between Les Contamines and the finish line I improved my ranking by over 100 places, I think helped by the cool night with it’s slow pace – I was able to avoid a lot of eating to let my stomach recover. The sun was coming out and the heat starting to build, but by 11am I was heading into the outskirts of Chamonix. More and more cheers and clapping from people on the trail encouraging me home, and the closer I got to the finish the more intense this became. I managed to speed up from a slow trot to a relative sprint by the time I reached the last 200m, responding to the cheers of the crowd, high-fiving and banging on the crowd barriers. It was a struggle to climb onto the podium but worth it for the shot. Tired but very, very happy. I crossed the finish line in 27hrs 13m 17s, coming under my target time of 28hrs, and nearly 6 hours ahead of the cutoff. 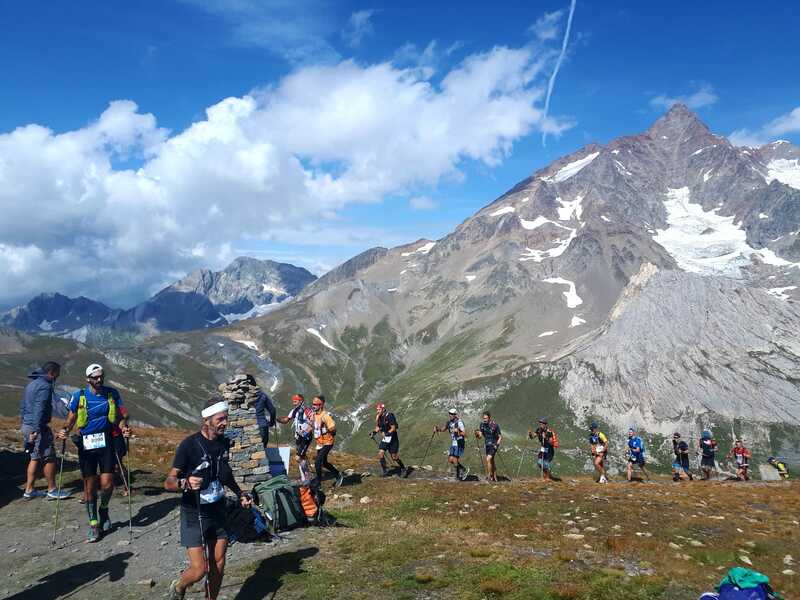 This year the UTMB organisers have announced that they’ve removed single use plastic cups, plates and utensils from the course which I think is a fantastic idea. 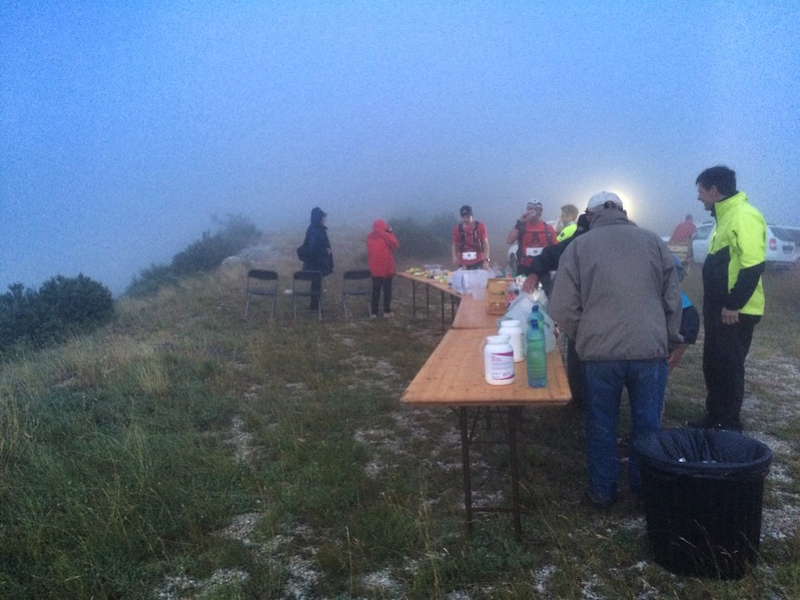 This meant that we all had to bring our own utensils – the only downside was that at aid stations I needed to keep getting up and down again (eg. after finishing soup, get up to get a Coke, then get a bowl of pasta) rather than be able to take everything I wanted over to the table. Next time I’ll probably bring a couple of cups/bowls rather than just the one. My pace throughout the event – you can definitely see it dropping off through the muddy night section. My ranking throughout the race – fairly consistent after Bourg Saint-Maurice. 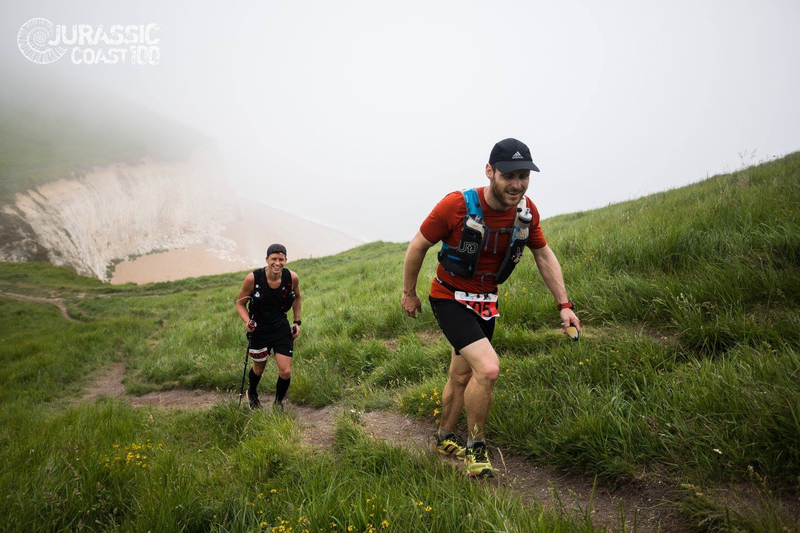 The Jurassic Coast 100 follows the historic clifftop trails along England’s southwest coast. 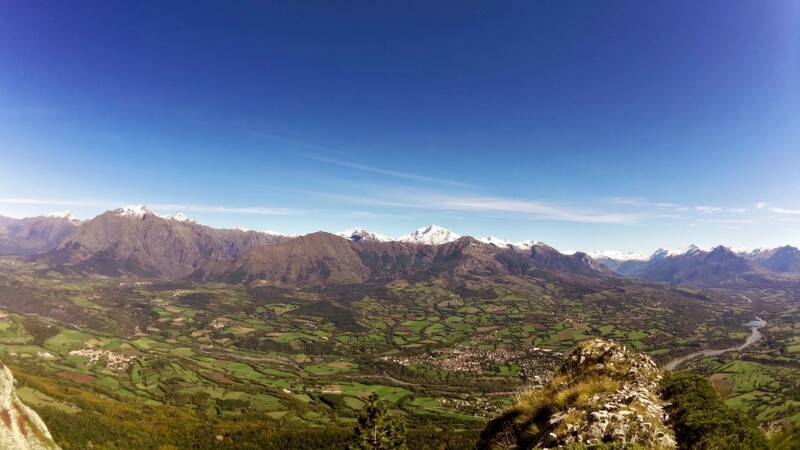 I’m in the process of accumulating points to eventually enter the UTMB one year. 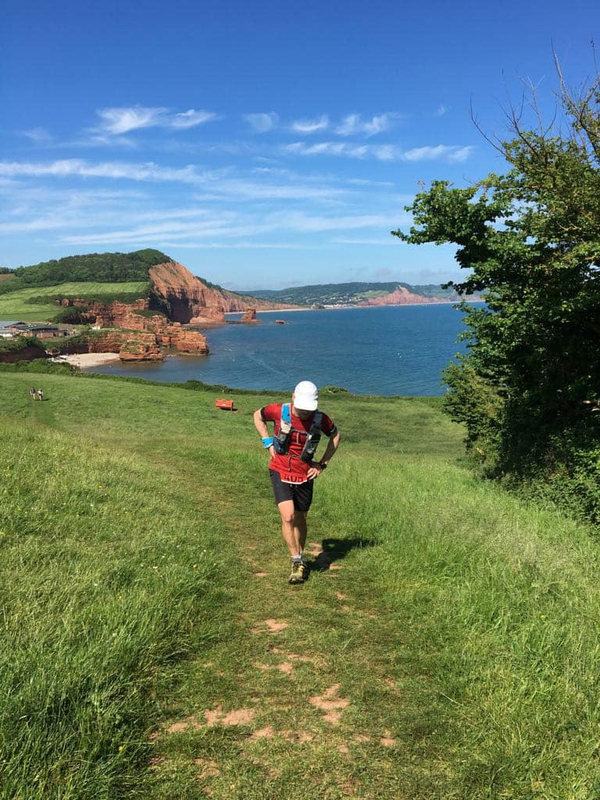 The furthest I’ve ever run was last year’s 101km CCC so I figured that a non-mountain trail like the Jurassic Coast 100 might be an easier introduction to the 100 mile distance than some of the Alpine monsters on my doorstep. 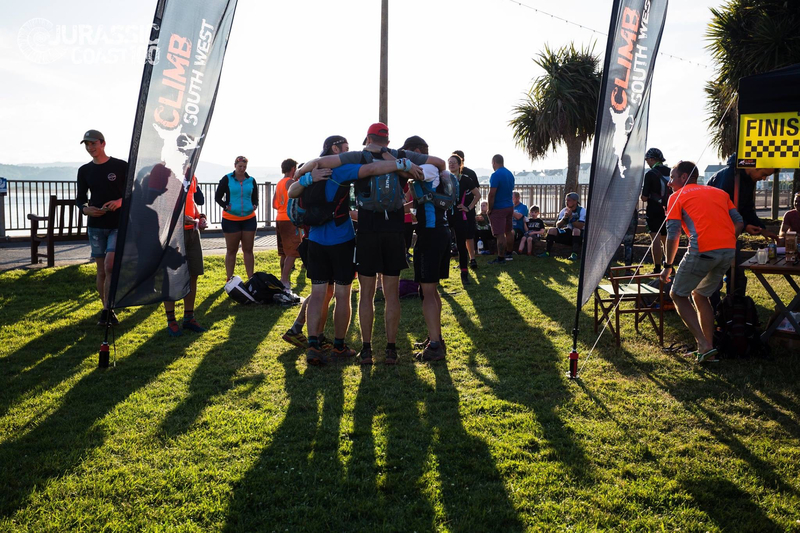 Climb South West are a Devon-based organisation who deliver a range of rock climbing and mountaineering activities, but have recently branched out into hosting fully-supported ultra distance trail races including 50km and 100km races along the Jurassic Coast in South West England. 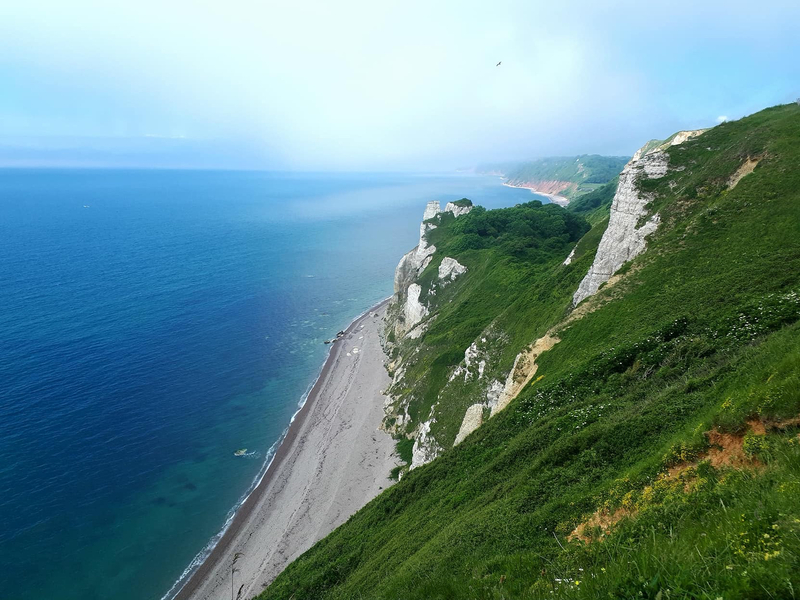 The Jurassic Coast trail covers some of Britain’s most scenic coastline – apparently. 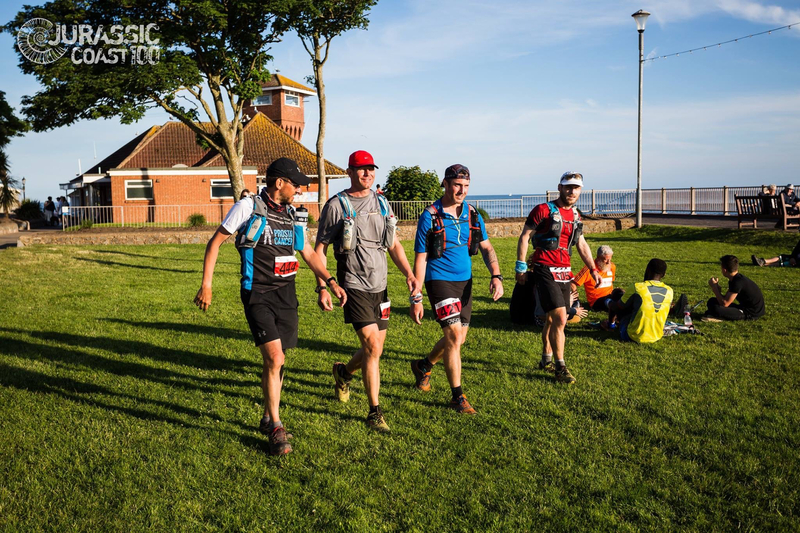 2018 saw the first incarnation of the 100-mile event – taking in the whole of the Jurassic Coast Trail between Studland Beach near Poole, in Dorset, to Exmouth in Devon. 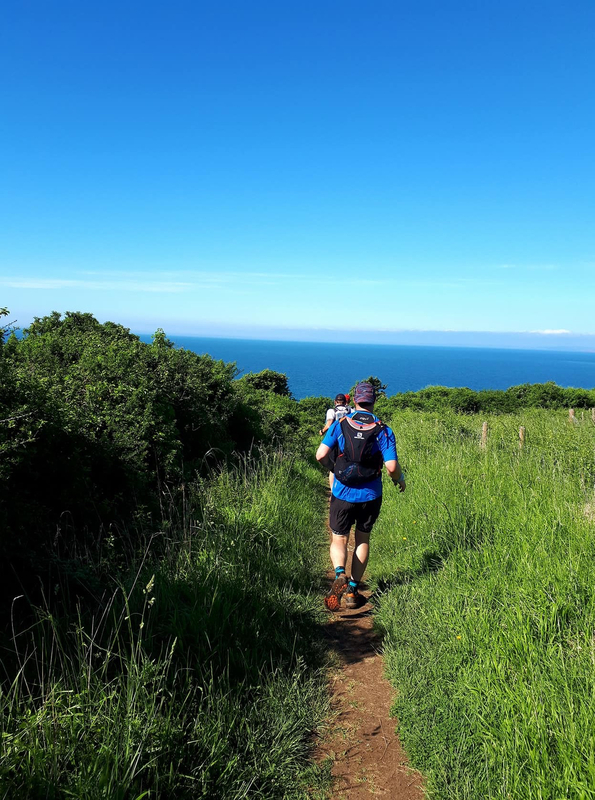 The route would also include the 100km and 50km races which would start at later points and follow the same trail, from Chesil Beach and Lyme Regis respectively. 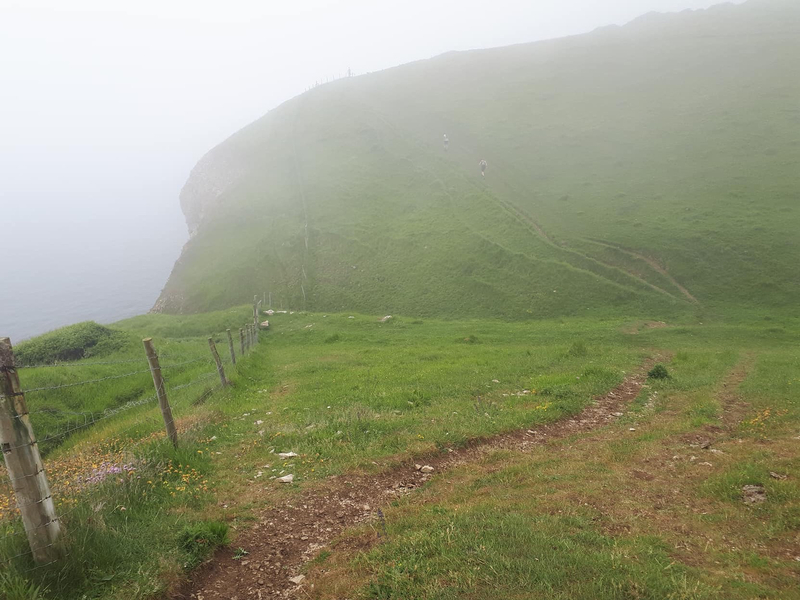 Although not particularly high (the highest point is around 150m), the route is like a row of hacksaw teeth with constant steep ups and downs as the paths trace the cliff edges of the coastal trail and the 100 mile route accumulates 5000m of vertical height gain. Still, that’s half the height gain of the UTMB so I figured this would be manageable within the 36 hour cut-off limit. Amy and I had spent the week in the UK visiting friends, and luckily we have some good friends who live close to the start line in Poole which meant I could avoid an early start. Mark and Amy accompanied me down to Studland beach where I managed to avoid the rush and get registered quickly and efficiently. That just left some double-checking of kit and rampant abuse of the National Trust toilets before the pre-race briefing, after which we were off at 9am sharp. The weather was misty and cool, but this suited me fine as heat has always been my nemesis in ultra marathons. We left Studland beach and ran along the hardpacked sand where the sea meets the shore for a couple of kilometres before making our way up onto the coastal path. In theory the route was easy to follow. Keep the sea on your left and keep going for 100 miles and eventually we should end up in Exmouth. In reality there were many points in the early stages where the route deviated, or where it was easy to miss a turn – especially around the many seaside towns and villages, and at one point about 30km in, where myself and a few others carried on oblivious in the mist until two runners ahead came back towards us having checked with some hikers – we’d managed to add an extra 4-5 miles on top. 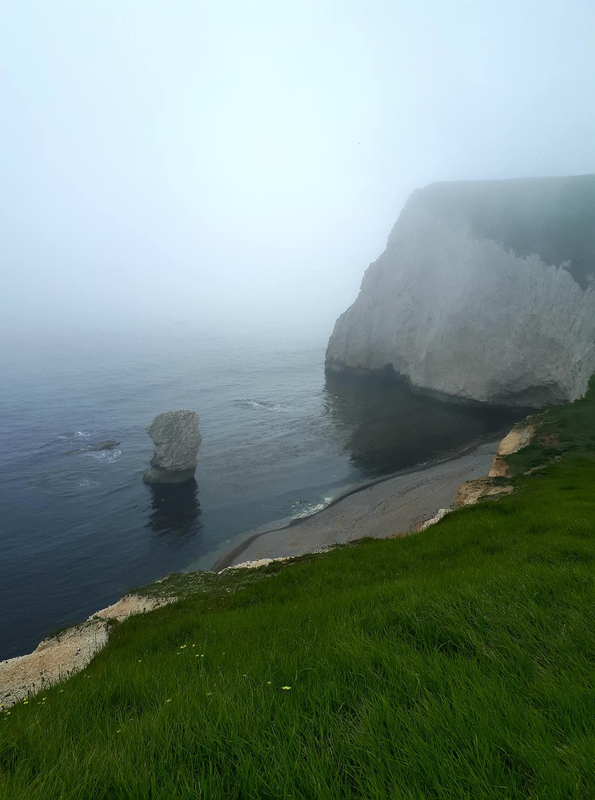 On the first day the mist obscured a lot of the great views – Old Harry Rocks, Lulworth Cove, Durdle Door. However it had the advantage of keeping the temperature down and meant that the running was fairly easy. 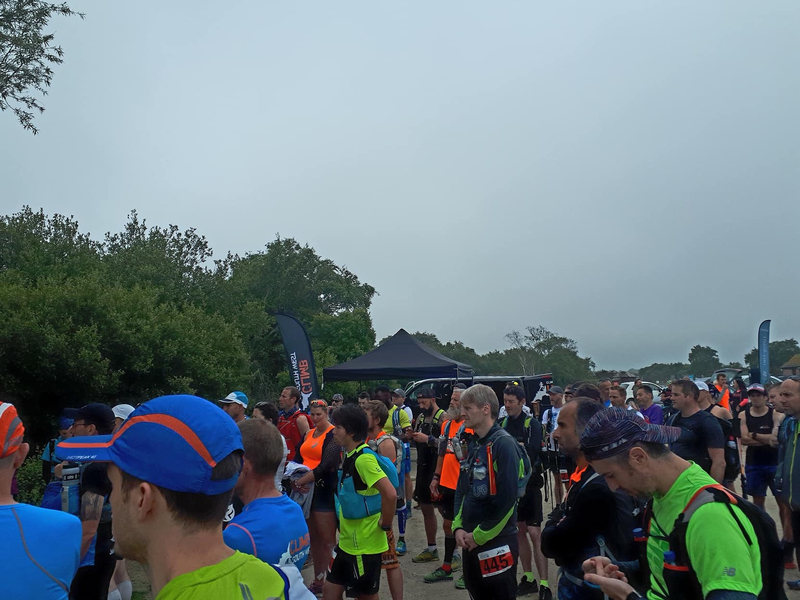 Only 63 runners signed up for the 100 miler but in the early stages we stayed bunched together and there was lots of chatting and camaraderie. The trail was generally easy to follow but sometimes it was all too simple to take a diversion. The checkpoints were basic – water, Coke and homemade cakes with a few crisps. However the help and attention was second to none with volunteers falling over themselves to help fill your water bottles. Luckily, being half term in the UK, all of the seaside towns and villages were packed with visitors and full of shops and cafes selling fish and chips, crepes and snacks so it was easy to stock up on other food. The first main checkpoint was basic but the homemade cakes were delicious. 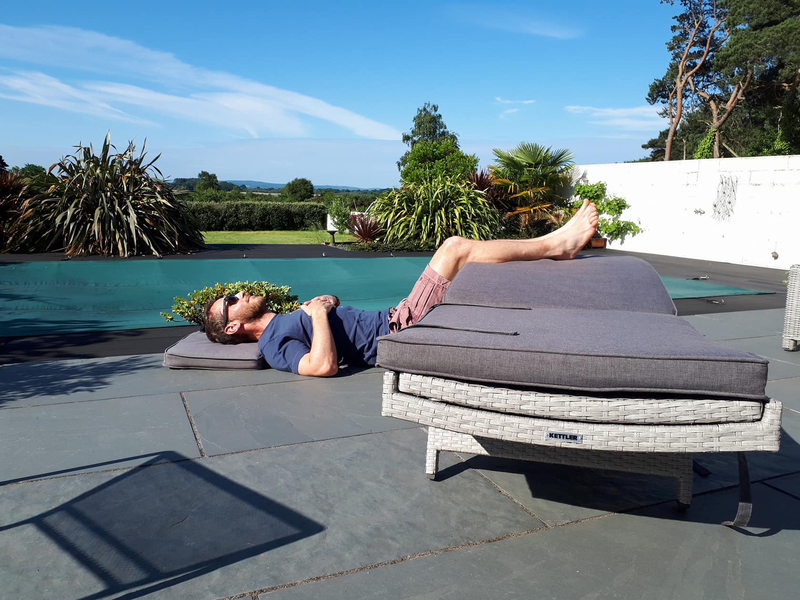 I’d asked Amy not to join me at the 40 mile mark at Chesil Beach – I would have access to my drop bag and I didn’t want the problem of having to wait for her if the journey took a long time like I did last year at Champex. However she’d been overruled by our friends Mark and Christine who were keen to come out and visit, and it was a pleasant surprise to see their faces after a long day on the trail. I was still feeling fresh (or at least as fresh as you can be after 12 hours and 40 miles of trail) but the run in from Weymouth had been quite a monotonous drag and they were also a big help in getting me fed so I could concentrate on changing into dry clothes and tending to my feet. This was also the start of the 100km route and I’d arrived about an hour before that started so the place was buzzing with dozens of fresh runners. 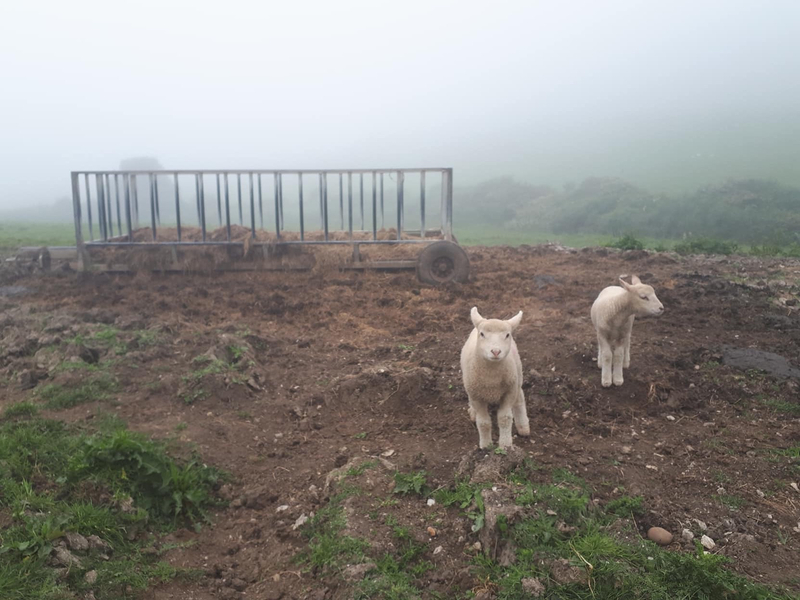 Fed, watered and into a dry change of clothes I felt quite refreshed on the way out, although the road back towards Weymouth was pretty bleak and on my own it was a little depressing. 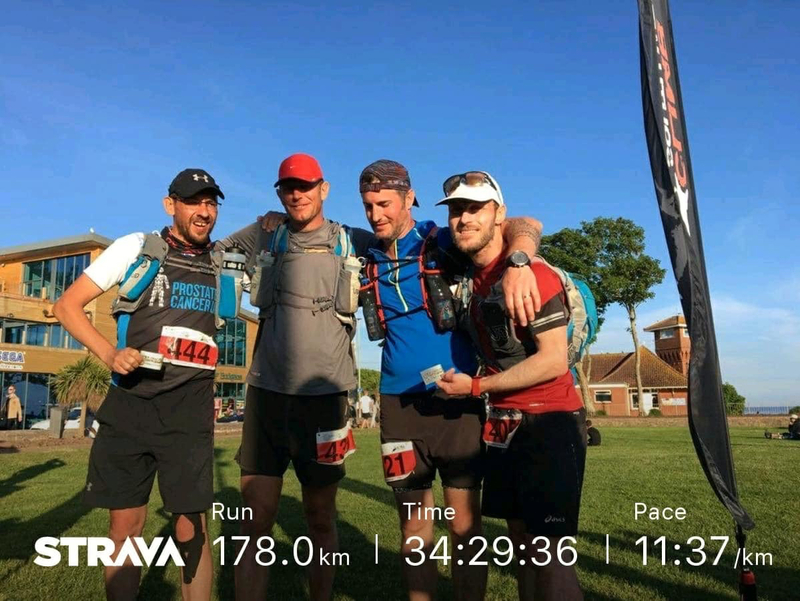 However after 30 minutes or so I caught up with Dave, Nick and Mathieu who I’d ran with briefly earlier on in the race and settled in with them as we ran into the night. 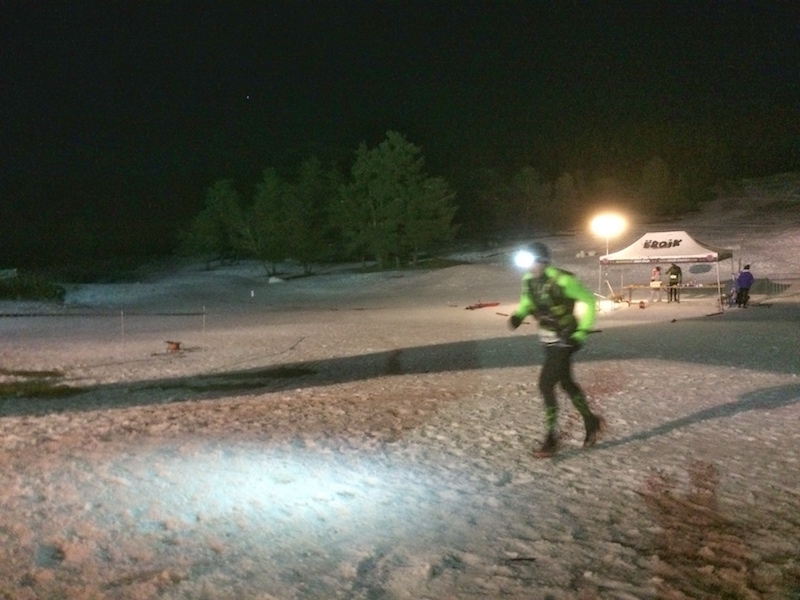 As night fell, the first 100km runners gained on us and we stood by to let them speed through. The night dew was making the long grass really wet so we stopped to wring out our socks and try our best to keep our feet dry as we were only really just over the halfway point at this stage. 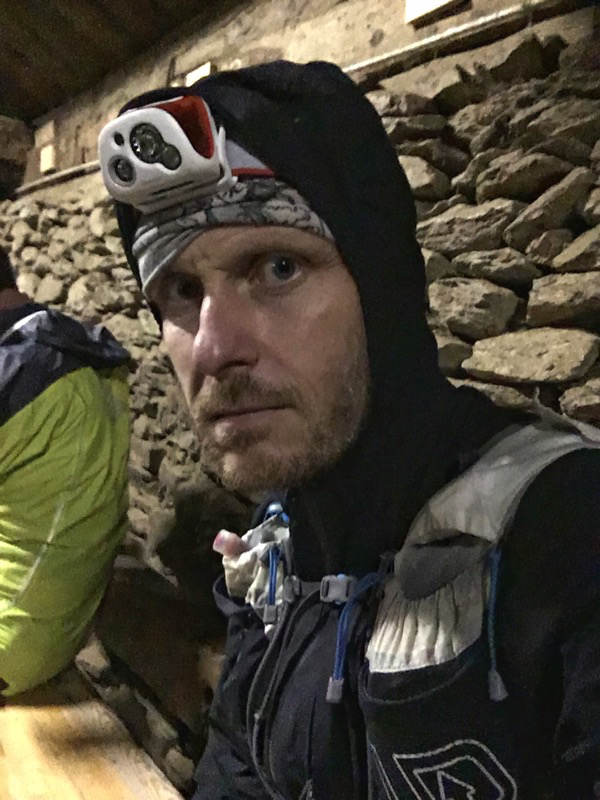 Mathieu mentioned that he was planning to sleep at the next checkpoint which we would get to at around 2am. However when we got there it turned out to be little more than a table of food in a car park with no shelter or anywhere soft to lay apart from the grass. 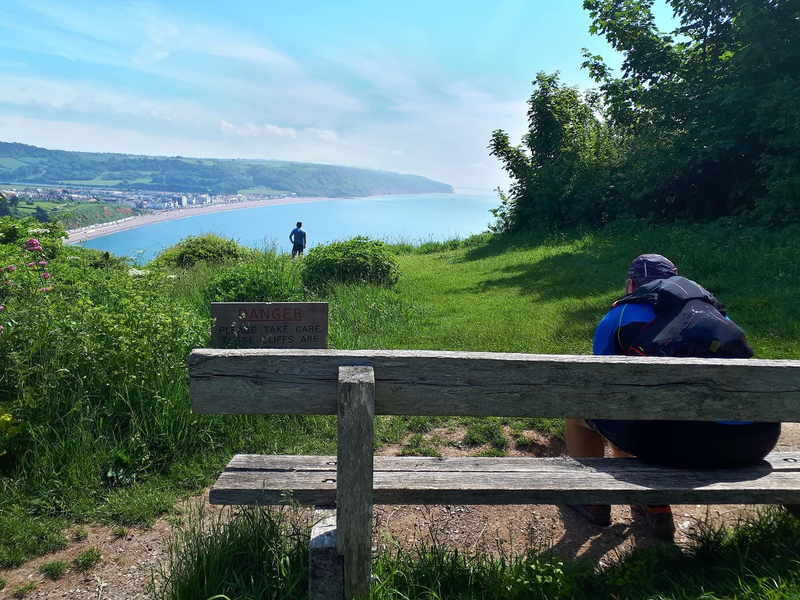 He was ready to give up at that point and the organisers mentioned that he would have to wait for the broom wagon, which would take him to the next checkpoint at Lyme Regis, around 25km away. 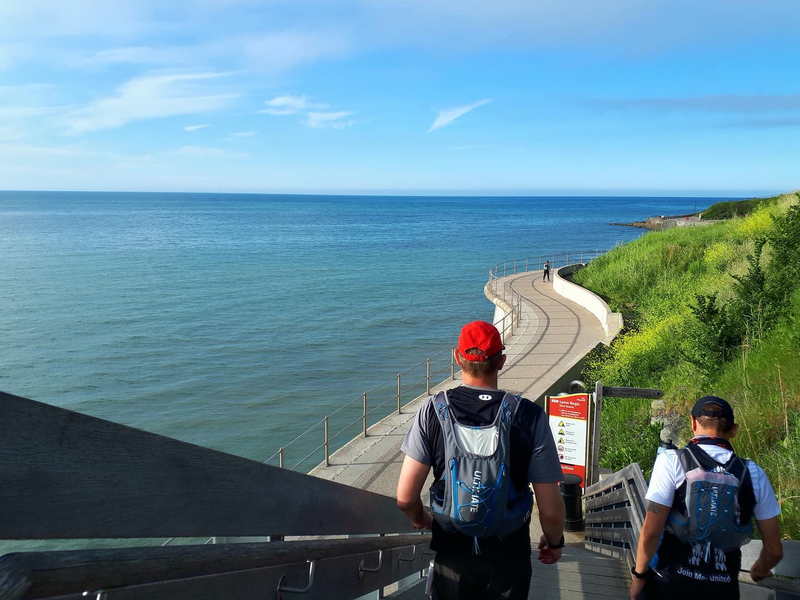 The rest of the group managed to convince him to keep running, at least until Lyme Regis where there would be hot food, and somewhere to sleep – so off we went. Thankfully the hours of darkness at the beginning of June in England are pretty short, and by 4am it was starting to get light again which lifted our spirits, and eventually after around 22 hours and 120km of running we made it into Lyme Regis Rugby Club. There were already a few 100 mile runners ahead of us taking a quick sleep on the floor. No sooner were we through the door and the volunteers were taking our water bottles to refill while we sat down, and fullfilling orders for tea and coffee. 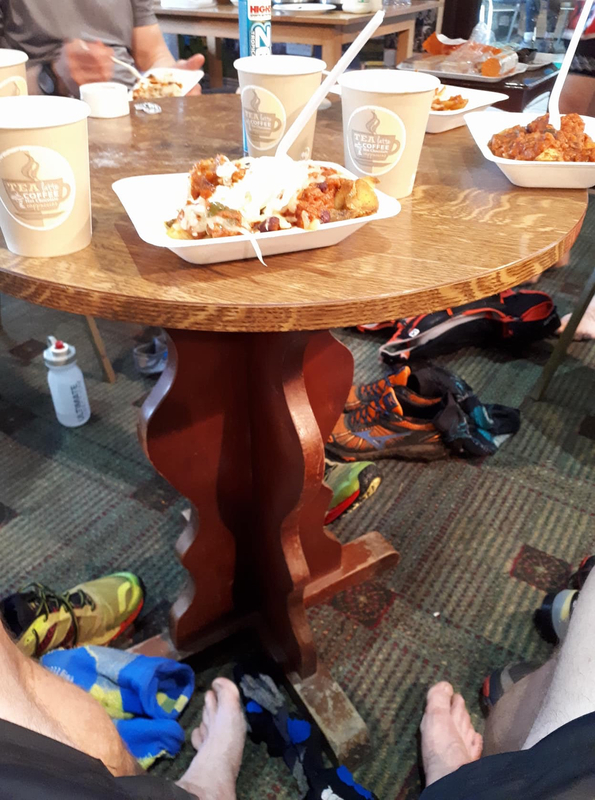 Out came the cook who asked how we wanted our chilli and potato wedges which were quickly brought out and despite my initial misgivings that it might not be the best food to have on an ultra, it did the trick. Dave reminded us that what had once seemed like a generous 36 hour cutoff limit was getting closer and we weren’t moving hugely fast so it would be best not to hang around too long. Mathieu seemed happy to continue running and had given up on abandoning so we all quickly taped up our feet and got back on the trail. After running through the night, the potato wedges and chilli, washed down with sweet strong tea at Lyme Regis Rugby Club were sublime. As the sun rose on the Saturday morning it was shaping up to be a beautiful summer’s day. The descent into Seaton golf club and another checkpoint. Mathieu, Davem Nick and I had now been running as a tight group for the beset part of 12 hours so we’d pretty much made an unspoken pact to stick with each and see this through. More checkpoints, more villages and towns as the day wore on. By now as we answered the common question of “Where have you run from?” to passing tourists, the answer of ‘Poole’, 80 or so miles to the east prompted more and more incredulous looks. 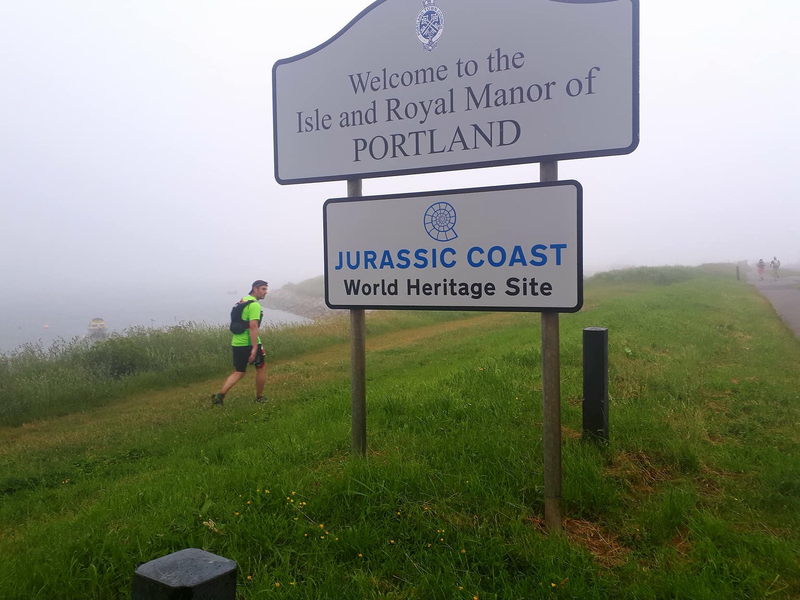 We also got lots of enthusiastic encouragement not just from tourists, but from other runners on the 100km and 50km trails as they sailed past, and then noticed our red numbers and shuffling gait. After 100 miles, 60 of which we’d pushed through together, we’d made it onto Exmouth seafront. Somebody taking a breather with a view. Amy texted me to say that Mark and Christine had insisted on coming to offer more encouragement along the way, and would meet me at the Sidmouth checkpoint some 18km before the end, rather than just seeing me at the finish. I was glad of the friendly face at this point because the lack of sleep and general fatigue meant that I was feeling dizzy and disoriented, and the balls of my feet were so sore that I was struggling to keep up with the others. 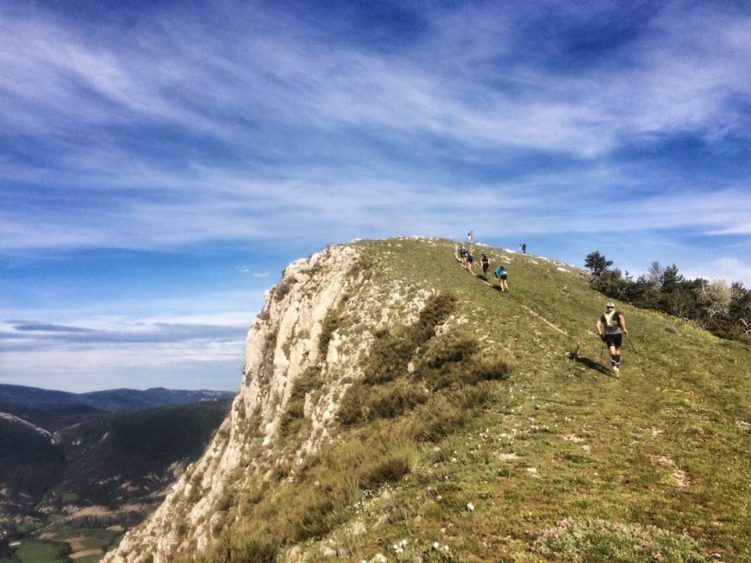 The peaks in this race aren’t high, but there are lots of them and they’re very steep. After changing into clean socks, I told the others to go ahead and I would catch them up – it was more of a Captain Oates style way to say there’s no way I’ll see you guys again and I think we all knew it. Amy is quite used to seeing me in ultras now and literally force-fed me salty chips, and then popped out and got me a bottle of Coke and a chocolate milkshake to take out on the next section. She also ran with me on this one – not hard as I wasn’t moving fast. 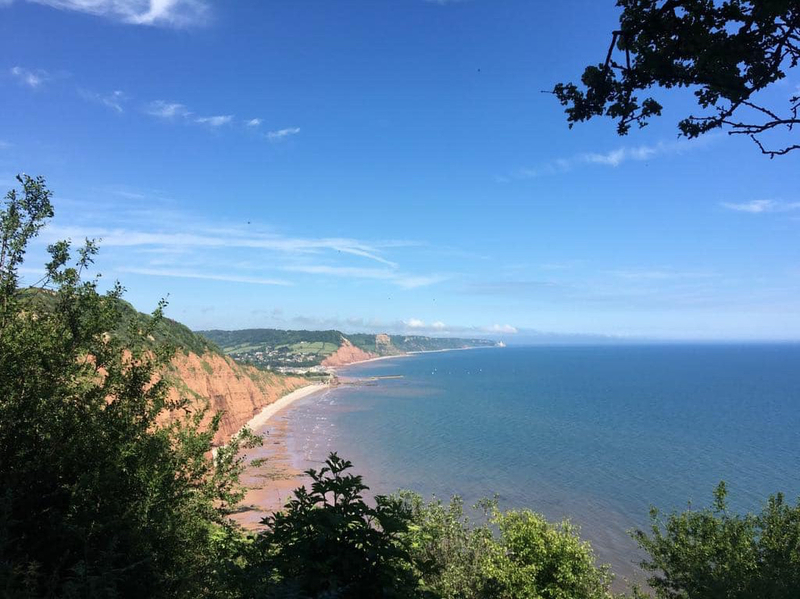 However she made sure I drank and ate regularly, and also badgered me into running the downhills, and just generally having some company meant that just after Budleigh Salterton, where she switched places with Mark as my pacer, we caught up with Dave, Nick and Matthieu. I was having a new lease of life but Nick, who had knee trouble for the whole race was struggling on the downhills. 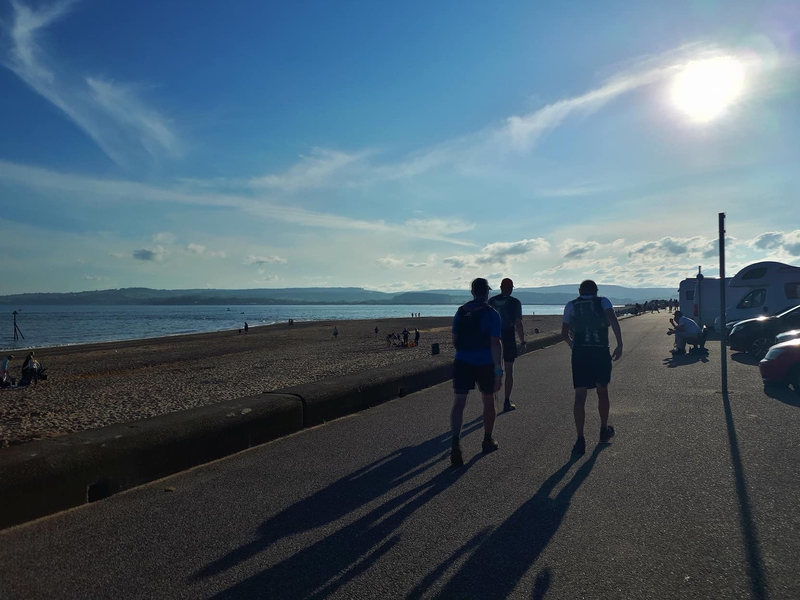 However we all stuck together and after the long drag into Exmouth we finally made it over the finish line as a group, with 90 minutes to spare until the cutoff. Relaxing the next day while waiting for a coffee and a bacon buttie. As a first attempt at 100 miles I’m still buzzing from the experience of having made it through, especially when the clocked distance was closer to 110 miles. It was hard, and although I had some very negative patches, not once did I ever feel like giving up or that I couldn’t finish – it was really just a constant re-evaluation of how long it would take. A large part of the success came down to the other competitors. Everyone along the route was really friendly, and then running with Nick, Dave and Mathieu for the final 24 hours we helped each other through – by encouragement, distraction, or just simply knowing to ignore each other when it was time to retreat into your own personal space. Obviously my first goal was to complete the race and avoid a DNF. In the back of my mind, based on my CCC time I thought I might be able to complete in 28-30 hours so the 34 hours this took on first glance seems like a bit of a disappointment. However looking at the results, coming in (joint) 26th out of 59 starters the abandon rate seemed quite high, but I think that just underlines how deceptively tough the route was. UTMB. 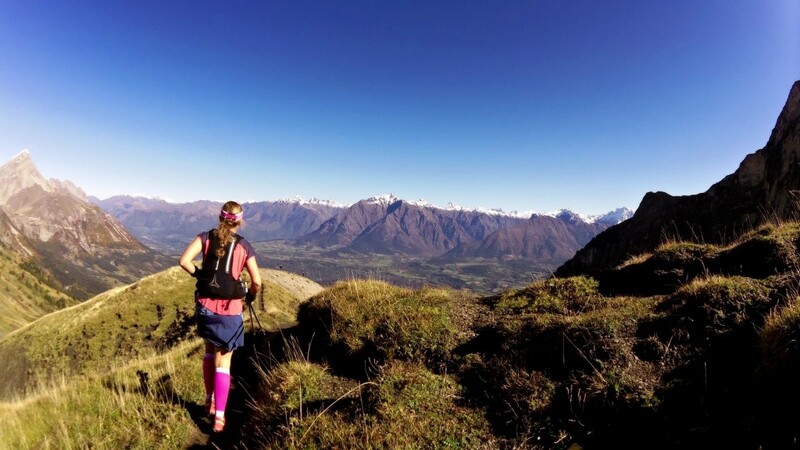 Probably the one event that even non-trail runners stand a chance of having heard of. 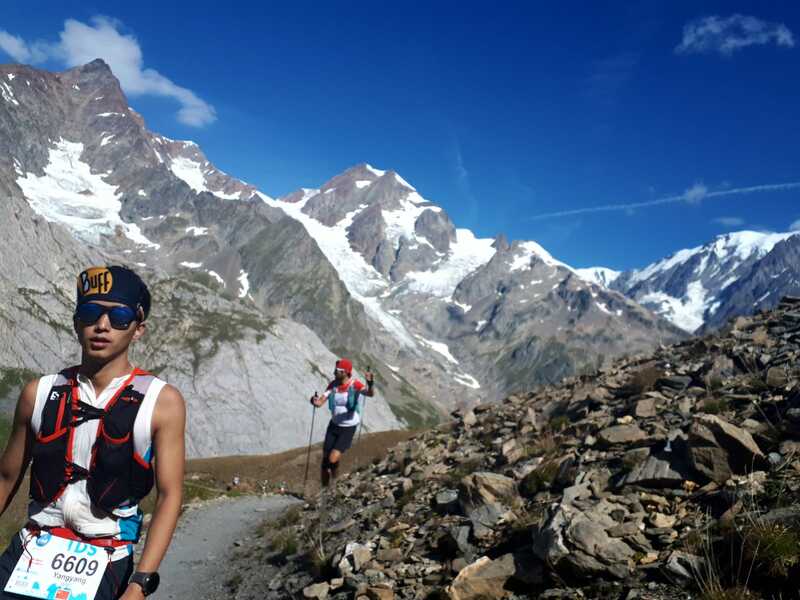 However recently it had been well-known for many of the wrong reason including a controversial open letter from the organisers of Hardrock 100 lamenting the fact that they were asked to pay for inclusion in UTMB’s qualification process. Cue lots of negative discussions on social media. UTMB/ITRA is a racket. It’s not real ultra-running and is more like a giant traffic-jam/human centipede. Ignore the circus and concentrate on more authentic events. I’m not getting into that though, you can read the other side of the story in ITRA’s response to the accusations. It’s not that simple though. Regardless of which side of the argument you sit, if you’ve ever been in Chamonix at the end of August you will be left in no doubt that the atmosphere is second-to none. 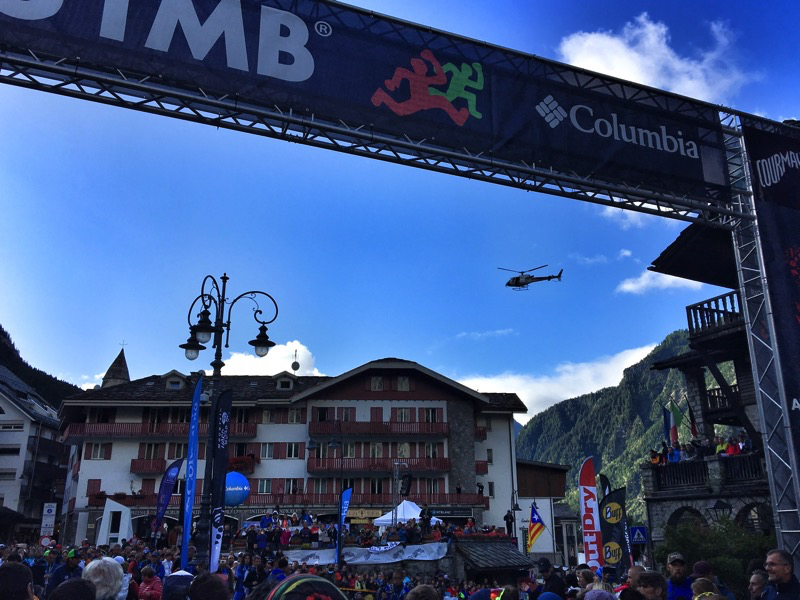 I had been there two years ago and watched a friend complete the UTMB event and was swept up in the carnival atmosphere that took hold of the town. I decided there and then that I wanted in on that action and that being stabbed by the odd trekking pole might be a small price to pay. The UTMB-proper (171km with 10,000m of elevation) is currently beyond my reach, not least because I haven’t run enough qualifying races but I’ve also never run further than 86km. I did however find that getting enough points to enter the CCC was definitely much more attainable so last December I entered the race lottery and to my surprise, managed to snag a place. 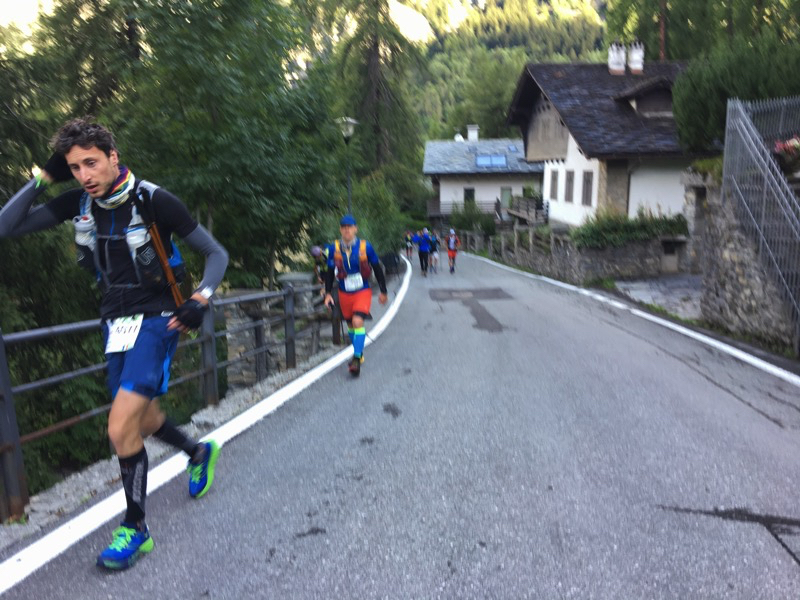 Although the CCC (Courmayeur, Champex-Lac, Chamonix) is the ‘little sister’ event of UTMB, it is fair to say that it’s a serious ultra marathon in its own right. 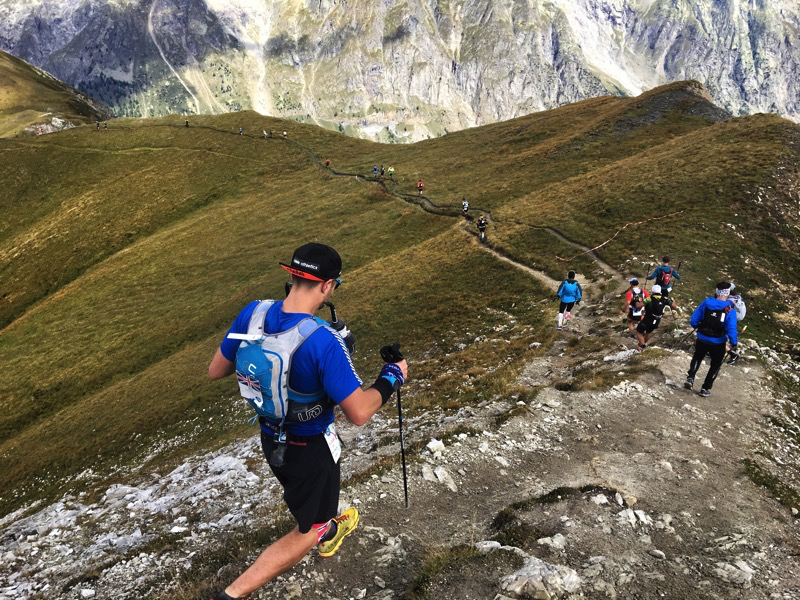 For the most part it covers the last two thirds of the UTMB with a few deviations and at over 100km and 6,000m of elevation it’s certainly not an easy cop out. 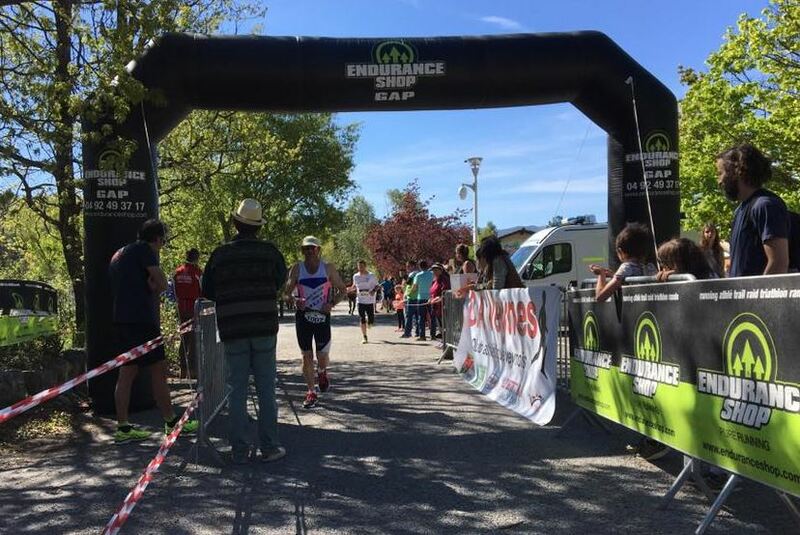 So this was my ‘A’ race for 2017, and after a recent DNF in the brutally steep 80km du Mont Blanc earlier in the year I was determined to be well organised, fully on form and run a smart race this time. 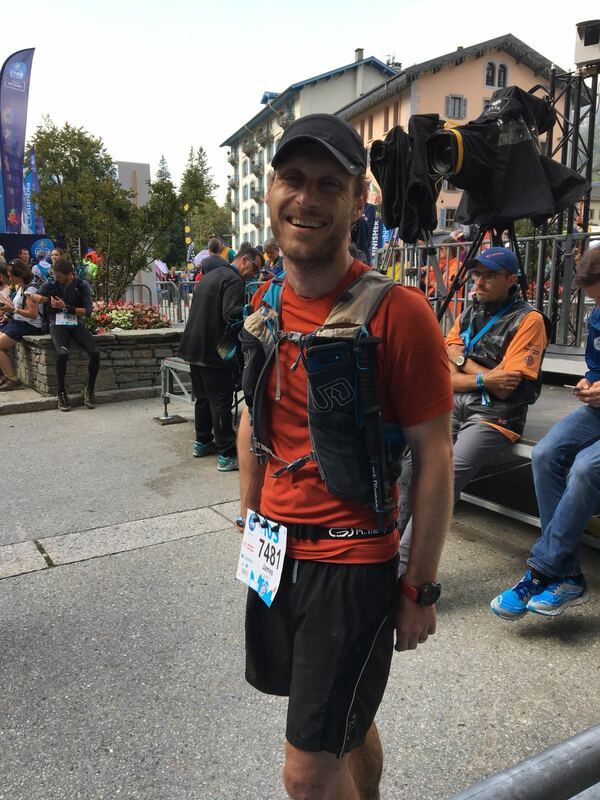 The weather would definitely help this time – after two straight years of blazing blue skies and high temperatures, I arrived to pick up my race bib in a grey and wet Chamonix being drenched by a light but consistent rain. The amazing mountain backdrop was hidden behind battleship-grey clouds. 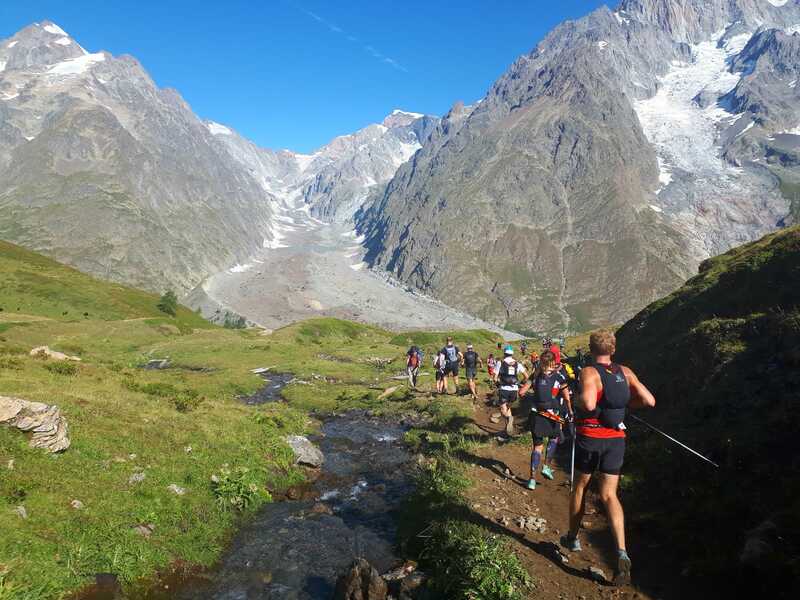 On the Friday morning I took the organised bus from outside my rented apartment in Argentiere, through the Mont-Blanc tunnel and into Courmayeur on the other side and was greeted by cool temperatures, sunny skies and thankfully no rain – perfect ultra-running weather. However we knew it wouldn’t last as the forecast for the later stages of the race was for very cold temperatures up high and more rain, possibly snow. 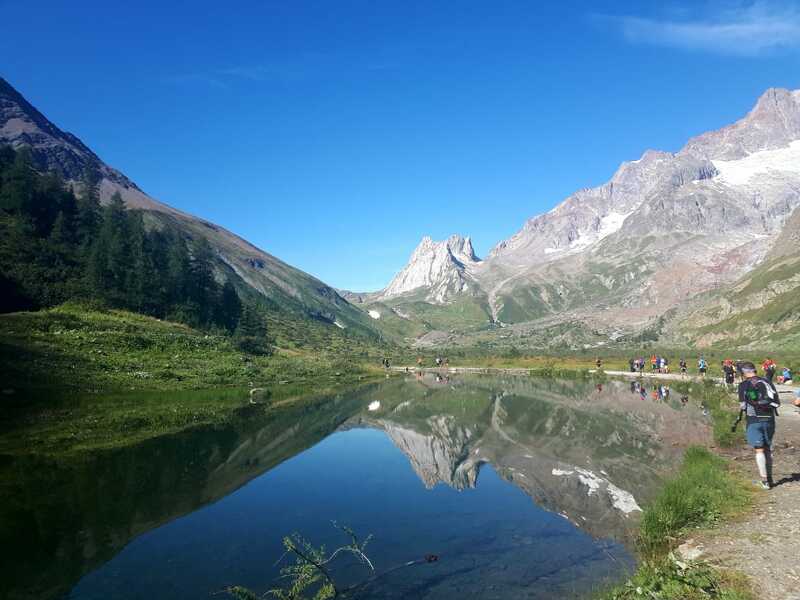 A last minute text from the organisers arrived as I was waiting at the start line, explaining that the final section between Col des Montets and La Flégère had been rerouted to avoid Tête aux Ventes – I was unsure whether this was a good or a bad thing. 2,150 lined up on the start line and I had previously heard lots of horror stories about huge queues as the race hits the first narrow trails so I was keen to get reasonable to the front. The race was divided into three pens which would leave at 9am, 9:15 and 9:30 respectively and I was in the second pen. The excitement and anticipation was building – large crowds had turned out and were very enthusiastic. Most ultras I run start at 4am so local support is usually less lively. Media helicopters buzzing overhead and an energetic PA announcer building up the enthusiasm of the crowd in three languages all contributed to a feeling of being part of something big – and then the starting gun went off, Vangelis’ Conquest of Paradise playing as we ran through the town of Courmayeur to cheering crowds and ringing cowbells. A route through the town meant that we got to soak up the atmosphere for a couple of KMs, and also had the benefit of thinning out the crowds before we hit the narrower trails. 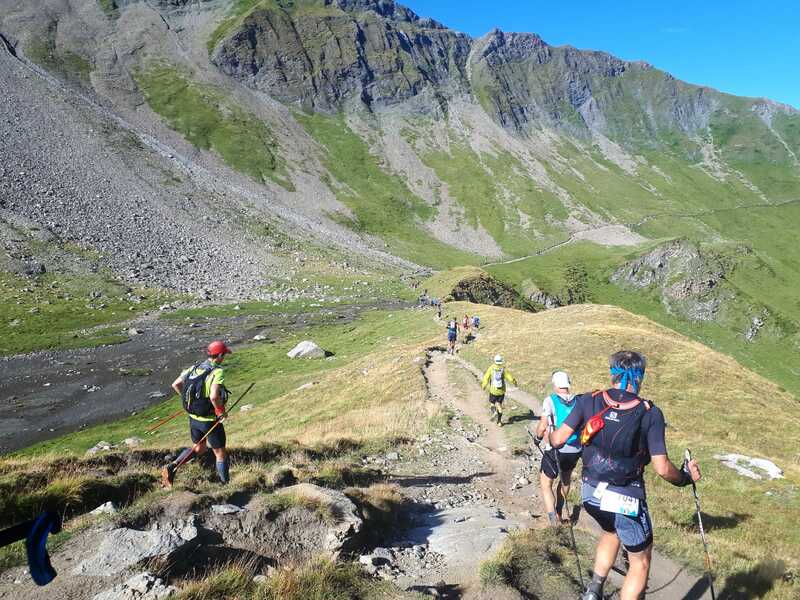 The traffic jams never really materialised – the first climb was almost a vertical mile up to the Tête de la Tronche in the first 10km or so, ensuring most mid-pack runners would take it easy so we soon set into a steady pace. Maybe I was feeling fresh and enthusiastic but the first climb really felt good, and didn’t seem anywhere near as steep as it looks on paper. 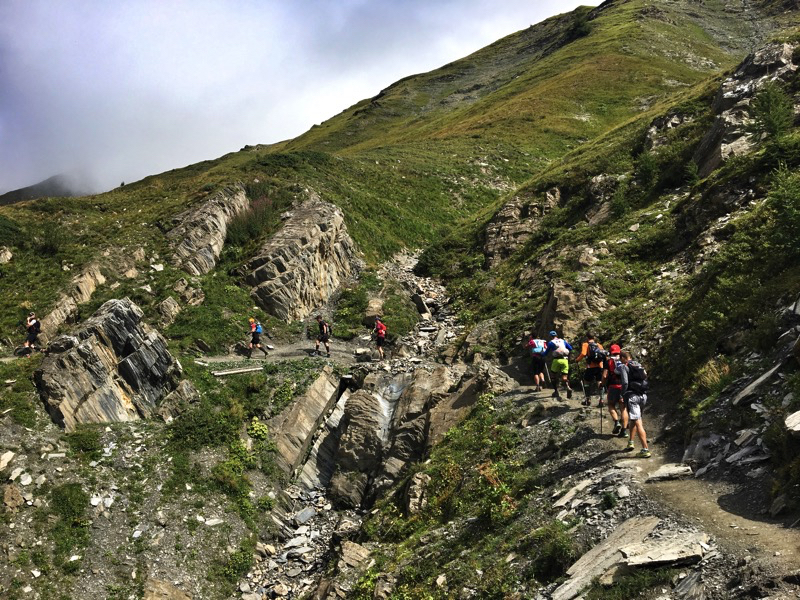 Pretty soon we were over the top and running down into the first aid station at Refuge Bertone. 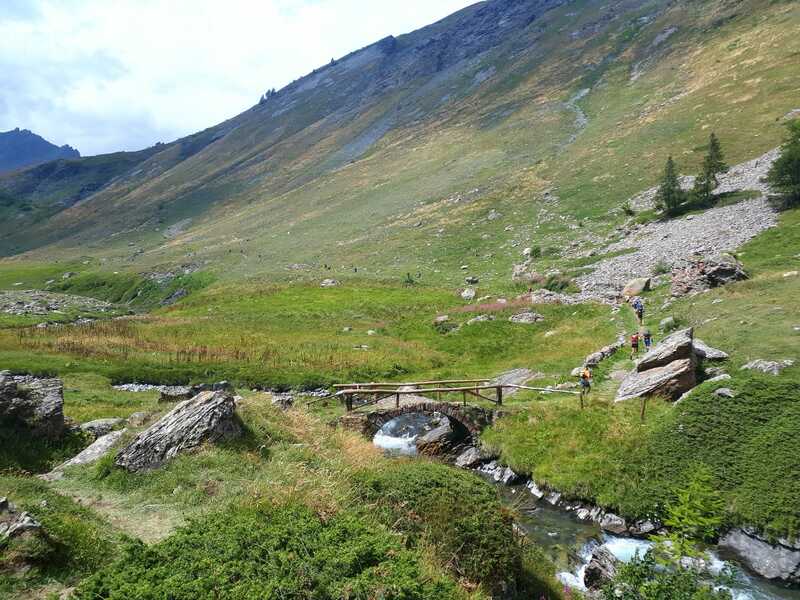 There was no need to hang around so I quickly filled up with water, grabbed some chocolate and dried apricots and headed out onto the lovely runnable section of 7km to the next aid station. 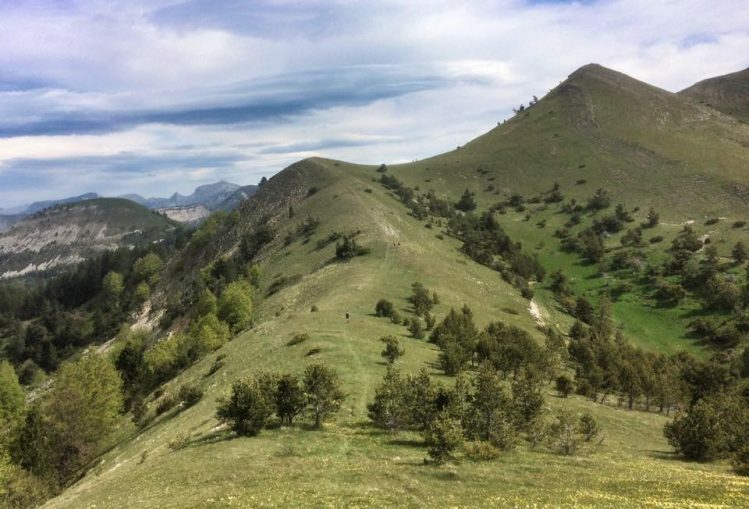 This next section was wonderful – rolling hills of single track with sweeping views of the Grandes Jorasses and Mont Blanc. 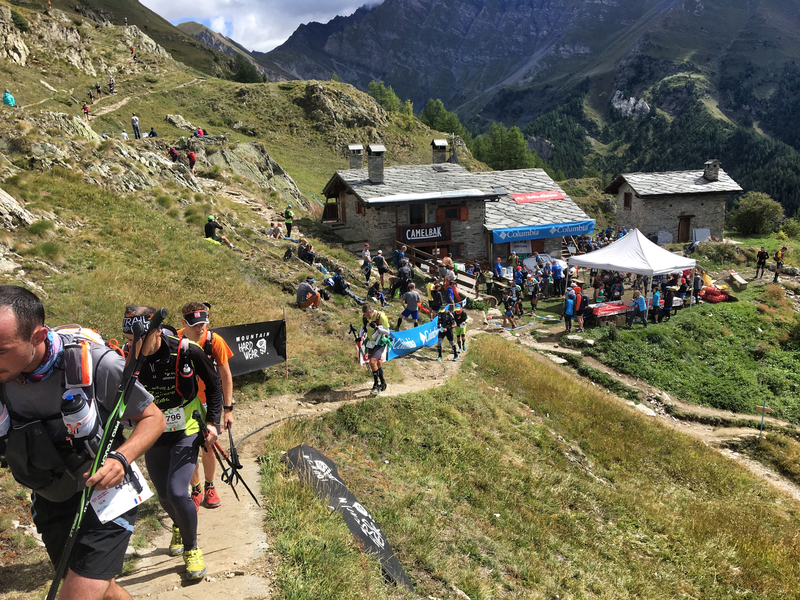 The weather continued to be cooperative and stayed cool and sunny – pretty soon I arrived at the next aid station at Refuge Bonatti, 22km into the race. 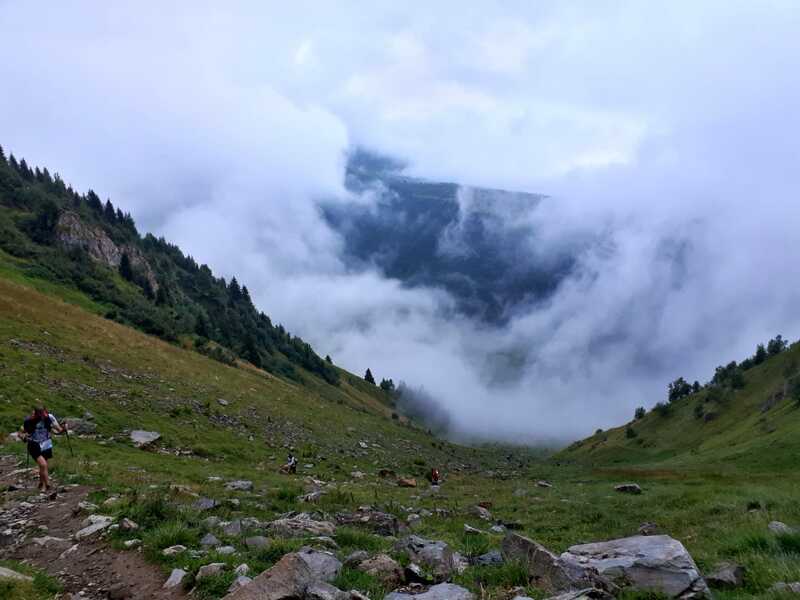 I knew that the climb to Grand Col Ferret was going to be tough, so I sat down and had a bit of a rest, powered by some of the delicious pasta soup handed out at all the large aid stations. It was only when I looked at the map that I realised there was still another 5km of running to Arnouvaz before the climb started. Climbing towards the Grand Col Ferret – the wind increased and the temperature dropped meaning the layers started to go on. As the race approached the Col Ferret it was obvious that the great weather wouldn’t last – forbidding clouds in the distance towards Switzerland suggested I’d soon be adding layers and waterproofs. The climb itself only took just over an hour but the difference between the top and bottom was pretty stark. I’d added a waterproof layer to keep out the wind, and gloves but arrived at the summit with my hands so frozen I couldn’t collapse my trekking poles to stow away for the descent – thankfully one of the medics at the top was happy to help. What followed was 1,500m of continuous descending into the Swiss side of the race, with a brief stop at La Fouly for more water and food. The amount of supporters at La Fouly was impressive, and it gave a great boost – I remember leaving the food tent and running through a tunnel of kids high-fiving on the way out. I was planning to meet Amy at Champex-Lac, the first aid station that allowed help from crews and about the only one where I would visit at a sensible time (the others were Trient and Vallorcine). She was tracking me on the official app and I seemed to be on track for getting there a little before 8pm, which meant I was pretty close to the 22 hour pace I was aiming for. 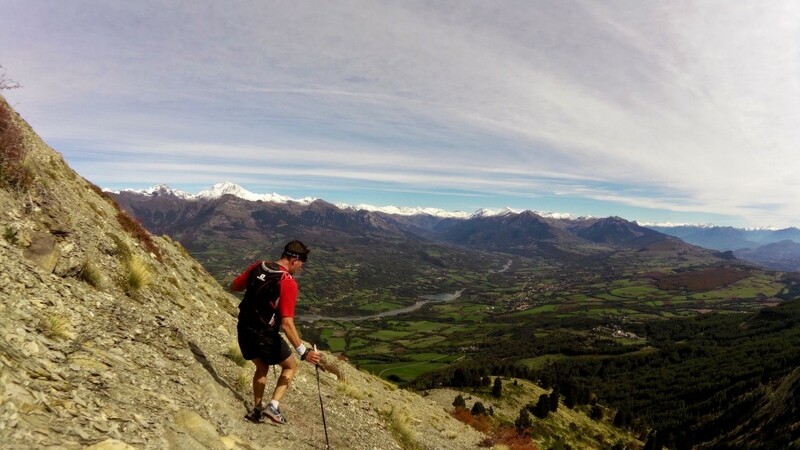 However leaving La Fouly and heading down into the valley we were soon on asphalt roads, which I thought would just link some trails, but we ended up running around 10km like that. It meant that, helped by some friendly encouragement from a fellow Brit I was running with, we were soon running 5.30min/km pace which meant getting to Champex-Lac early. It turned out that the route had been diverted because of landslides caused by the recent bad weather. It was a welcome repreive from the technical trails but meant that I had to phone Amy to get her to start the one-hour drive to Champex early. On the approach to Champex-Lac the rain really started to come down strong and the deeply rutted, muddy forest trails were quite depressing to negotiate in the falling darkness, perhaps because I knew that I was so close to a change of dry clothes and some moral support. The curse of being a mid-pack ultra runner meant that the aid station tent was absolutely packed with runners and their associated crews. This made it difficult to lay out kit on the long bench tables but Amy managed make sure I went through all the right checks, helped me get into dry and warm clothes and also brought me a steaming hot flask of freshly made pasta and potato soup. Leaving the aid station I was shocked how cold my muscles had got, and running out of Champex-Lac was more of a hobble, despite the best efforts of the supporters who were yelling encouragement. It was almost a relief when the pavement gave way to steep forest traila and I was able to focus on climbing rather than running at any particular pace. The latter half of the race comprised of three big climbs – none of them quite as large as the first two, but significant, in the dark and in the pouring rain on tired legs. I mentally broke it down to just powering on through to the next big aid station and actually found the climbing to be straightforward – my legs were still feeling good. On the long climb up to La Giète it became evident that this was going to be a long night. The heavy rain was turning the already saturated ground, trodden by the shoes of hundreds of other runners in the last few hours into a boggy quagmire. In parts the trails were rocky, and we could use these for some traction, but the clay-like, light-brown mud was oozing down the mountain between the rocks like gravy. 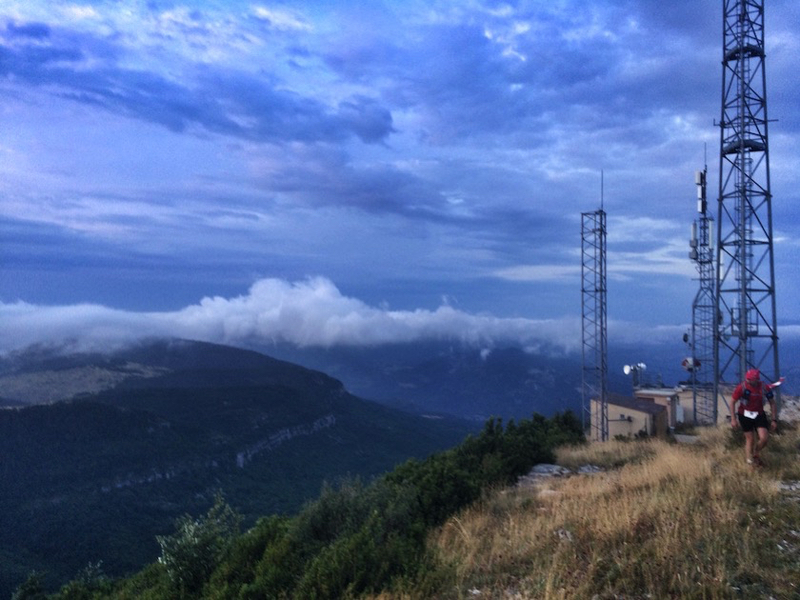 We finally made it to La Giète, where a small barn on top of the mountain, lit up and playing techno music offered some shelter and hot soup. It was a case of rinse and repeat for the next few hours as we descended to Trient, restocked, climbed more monstrous, muddy mountains and slipped and slided our way back down into Vallorcine. The descents were getting treacherous and despite using trekking poles and took at least a couple of falls but thankfully they didn’t cause any problems. By Trient, certain body parts had begun to chafe and I ammused the staff at the medic tent by asking if they had any cream, although I couldn’t remember the name in French so had describe it. I’m sure not for the first time that evening, the medic handed me a tube of anti-frottissement cream and pointed towards the bathroom; I soon anti-frottisée’d parts that will remain nameless and was able to resume the glamour of an ultra marathon at one in the morning. 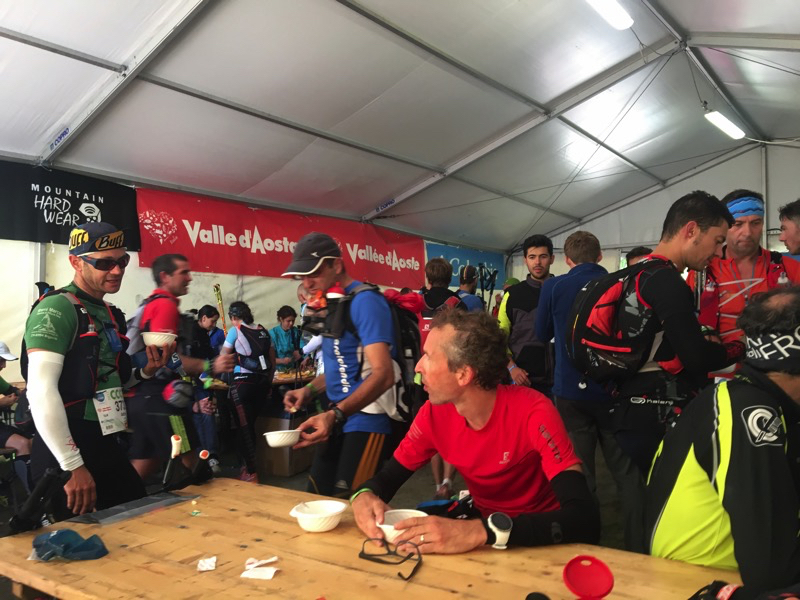 At Vallorcine, the last major aid station it felt like I was almost home but there were still 19 more kilometeres to run, and the temporary notices on the walls made it clear that the new route, bypassing the Tête aux Vents was not necessarily going to make things easier. Leaving the aid station the next few KMs seemed much gentler than the profile on the course map suggested and I made pretty good pace, setting into a rhythm on good, relatively dry roads. After a while though the paths got ridiculously technical, with huge knotted tree roots and large rocks strewn across the path which made mincemeat of our tired legs and frazzled, sleep-deprived brains. The real sting in the tail came two-hours on from Vallorcine, with a 250m descent on the same horrible paths, only to be faced with over an hour of yet more climbing up to the ski station of La Flégère. The elevation amount wasn’t particularly huge, but the trail just seemed to go on forever and was a real destroyer of morale. While sitting in the aid station at the top of the climb I chatted to a couple of other runners who were all cursing the organisers and expressing disbelief in the last section. 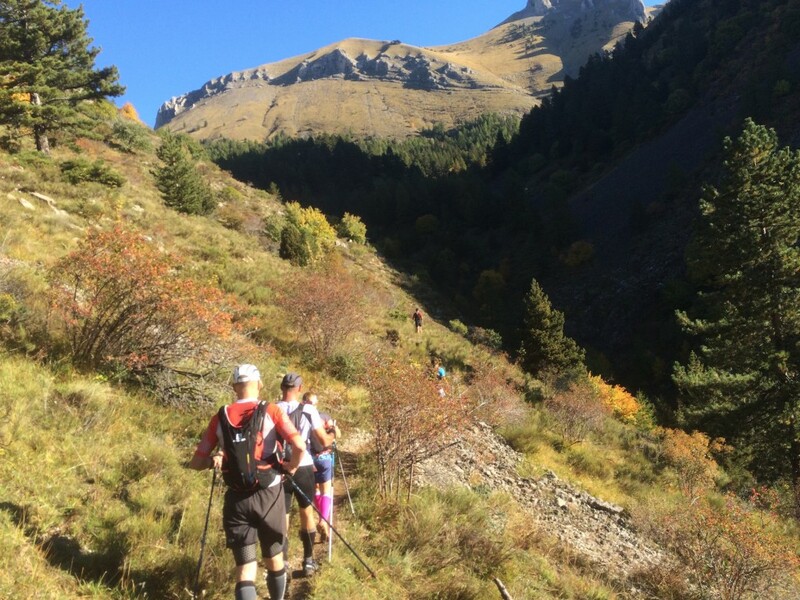 However the good news was just 8 more KMs and aroun 1000m of descent to the finish. The descent had its technical sections but generally got better the further I descended and this last section only took around an hour. 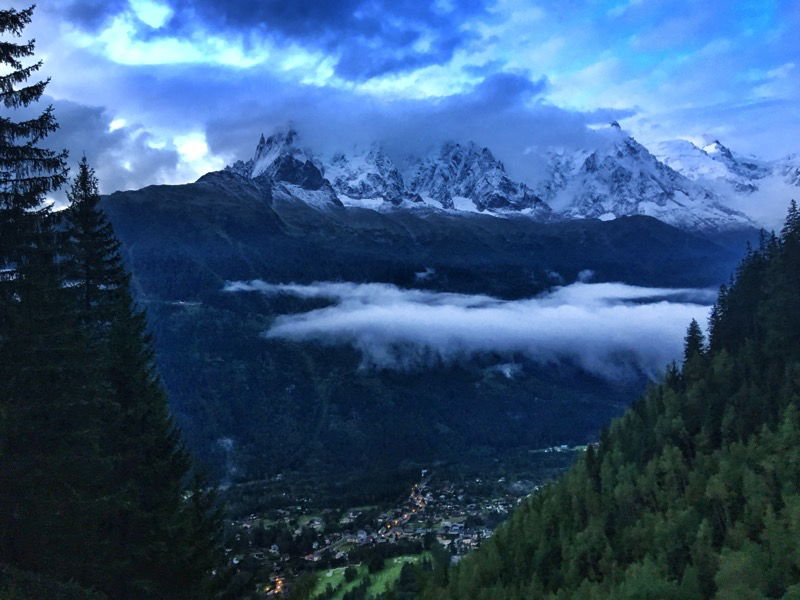 It had the added bonus that it was starting to get light, and I got to view Chamonix down in the valley below, framed with the always-amazing sight of the Mont Blanc massif, freshly dusted with snow from the previous night poking out from amongst the clouds. I was dreading a long run-in through Chamonix but the trail joined the town just near a hotel I’d stayed in before so I knew it wasn’t long to the finish line. What’s more, my legs actually felt (relatively) great despite almost 22 hours of running. In fact I was minutes away from beating my (admittedly arbitrary target) so I picked up the pace, passing a few people hobbling into town). On the way in I was surprised to see Amy a few hundred metres from the finish, and she actually had to yell at me to slow down while she ran round to the finish line to take a picture – I still managed to finish in a time 21:58:32, 854th place overall and 267th in the veteran male category V1H. I’m really happy with my result – since the first goal was to run a good race and finish under the cutoff time of 26:30. Looking at my placing throughout the race, I started off quickly (due to not wanting to be caught in traffic jams), stayed ranked around the mid 900s in the middle of the race and managed to claw back another 100 or so places. I didn’t set the world on fire but it was my first 100km distance, and considering how poor the terrain was in the latter half of the race I can’t complain. On the other hand, the cool conditions probably helped since I have a tendency to suffer from the heat in ultras. A moment of reflected glory on the podium. 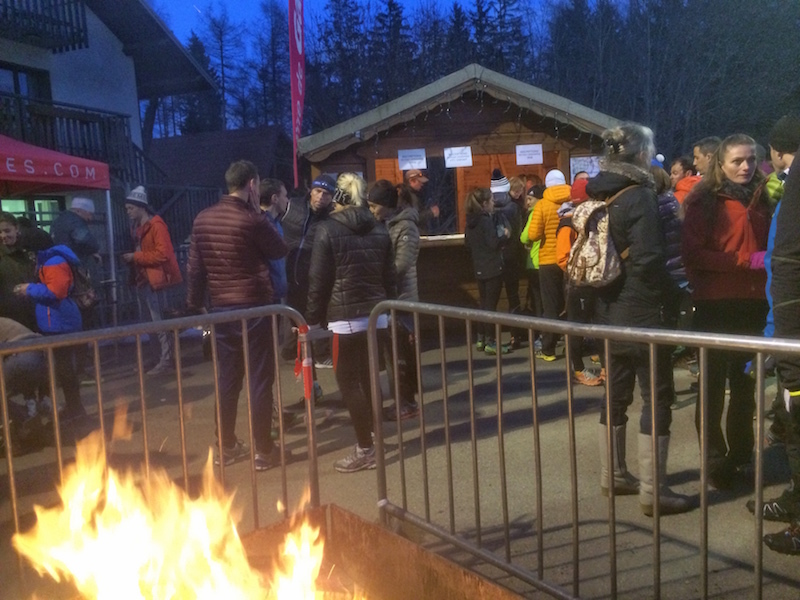 The race organisation was superb, with well stocked aid stations at regular intervals but what really stood out for me was the support of the crowds. In all three countries there were so many enthusiastic supporters in the towns and villages, at all hours of the day and night, and even up on the sides of remote trails in atrocious conditions. 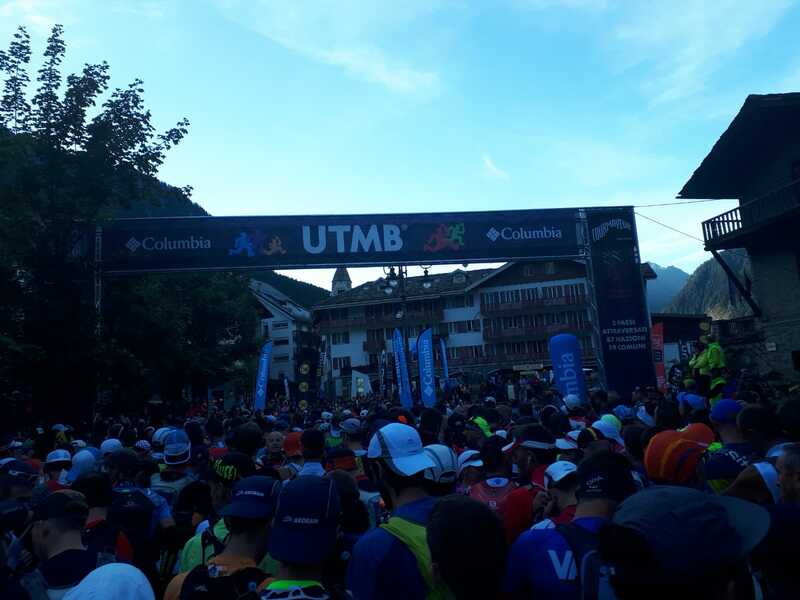 I genuinely enjoyed the event and this has only made me think that the the full UTMB should be on my tick list one day. Its been a few years since I’ve run a ‘proper’ ultra so I was looking forward to getting a long distance race under my belt in 2016. 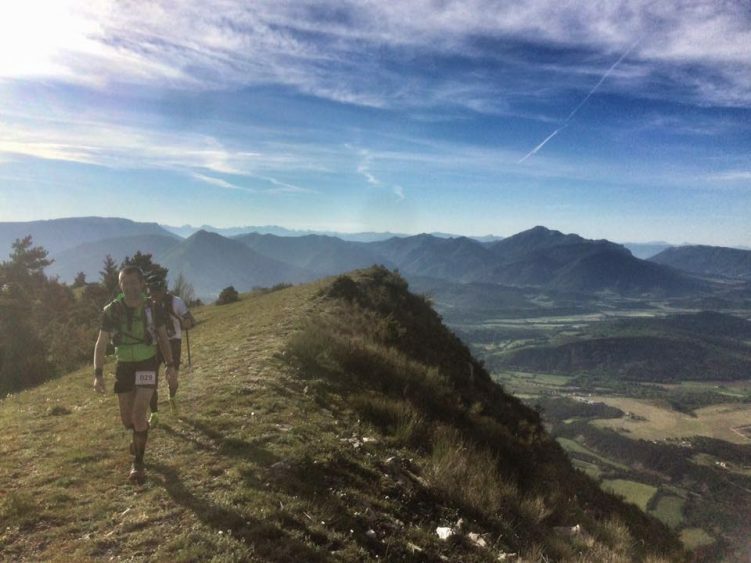 Through social media I found out that a new race had been created fairly close to me – the Ultra Tour de la Motte Chalancon.At 86km and 4,500m of height gain it was a simialr profile to past ultras, and I thought it would be a good test to see if I could set myself up for some longer stuff later in the year. 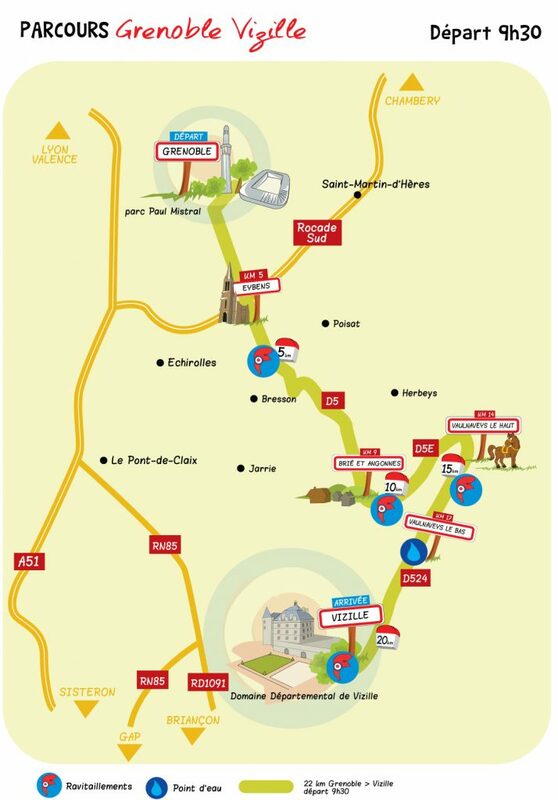 It feels odd to set your alarm for 2.50am, but that’s what I did, and was successfuly up, changed and out of the door by 3.30am, managing to park in La Motte Chalancon and get to the start line just about in time. 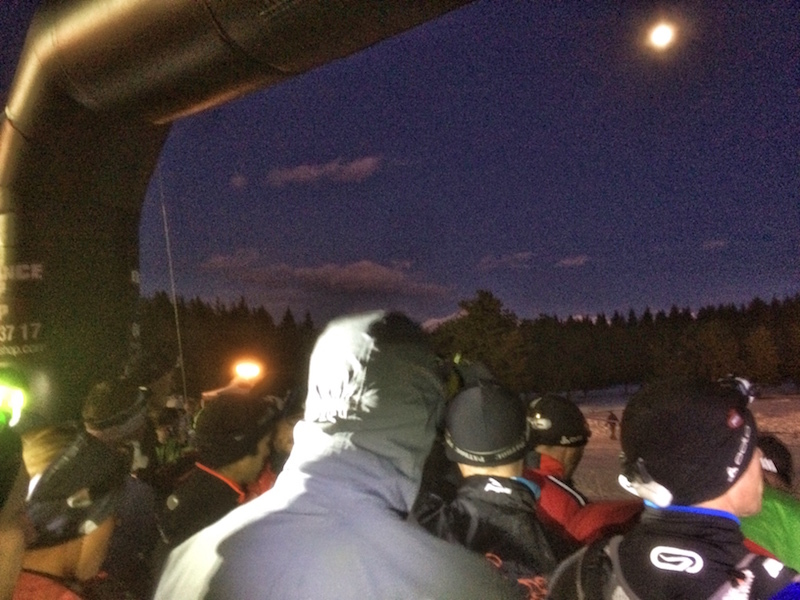 The problem with 4am race starts is that nobody in their right mind wants to get up and at that time and watch 100 lunatics head off into the dawn at a very slow pace so consequently in a lot of races there’s not much crowd support. 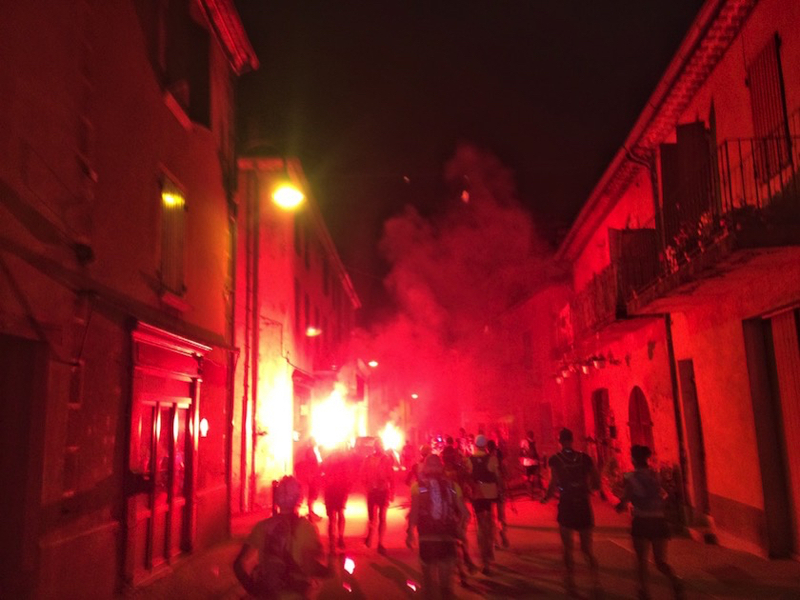 This was no different but the organisers made a big effort, playing music and having the marshalls burning red flares as we ran our way through the streets of the town. We soon left the town and headed up the first climb – the usual strung out line of head torches as everyone settled into a rhythm. 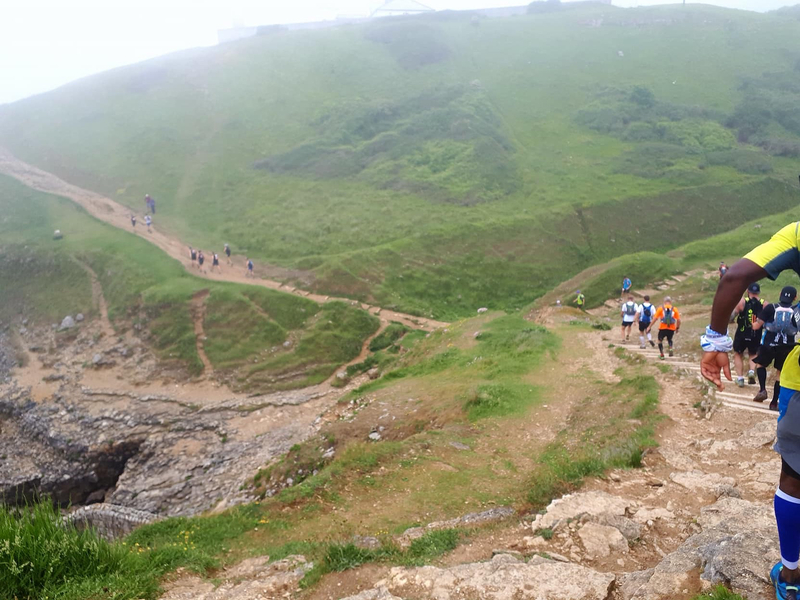 There’s never much to see and with the low cloud from the storms we had been having still clinging to the mountainsides, the view was fairly dull so I just got my head down and followed the feet of the runner in front. 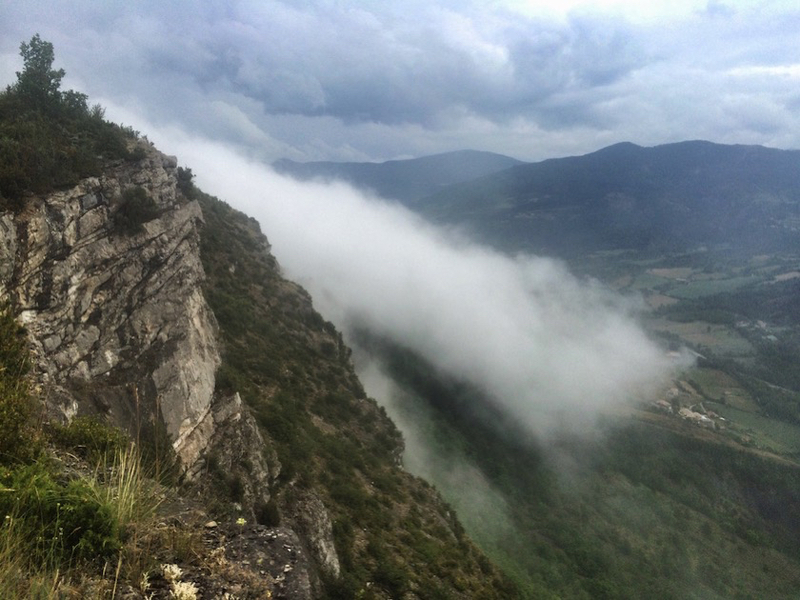 The middle of July in the Provençale French Alps is hot. Luckily however, after day after day of 35ºC blue skies the rains came and the cooler weather arrived meaning the conditions were much cooler. It was still warm enough at the 4am start to run in t-shirt, and I liberally applied the SPF50 at the start, but hopefully heat stroke was not going to be a significant issue. Unfortunately the downside to this was that at the top of the first climb after a couple of hours on the trail, we didn’t really get to see much of a dawn – just a murky twilight but gradually the views got clearer and clearer. I didn’t have any support crew at this race, so there was no opportunity to eat anything I either couldn’t carry mysef, or find at the food stops. Although the race was only 86km, it really would have helped if there had been the opportunity to leave a drop bag. I tend to find that French races don’t really offer this unless we’re talking about the very long events (e.g.. 100 milers). Since the weather forecast was poor, and I couldn’t carry all the food I wanted, being able to leave a change of shoes and some food at the halfway point would have been a big benefit. As a result, I stuffed about a dozen energy bars and 8 or 9 gels into my race pack and figured I would take my chances with the aid stations. 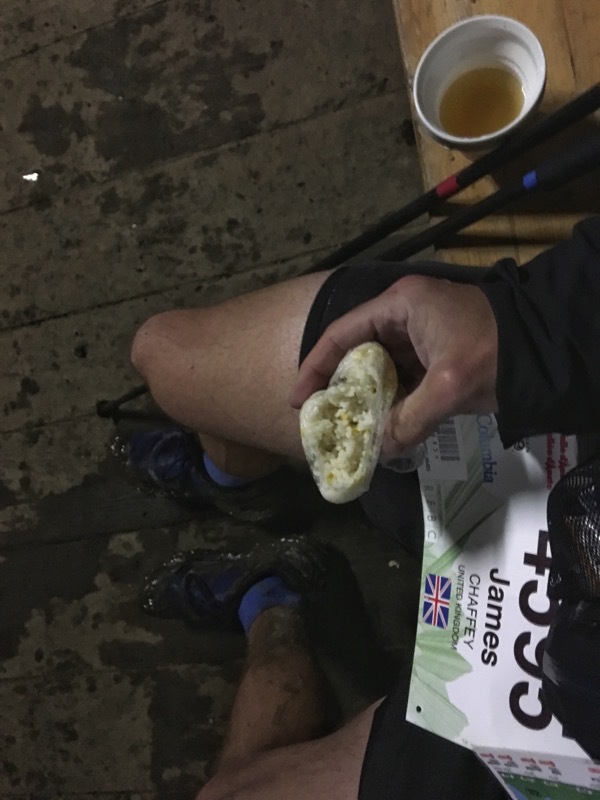 Unfortunately the food choices at the aid stops weren’t amazing (crisps, cheese, salami, crackers, apricots etc, with soup at later stops) so I probably ended up eating too many of my energy bars and gels, meaning I took on way too much sugar and I started getting digestion problems after about 60km. 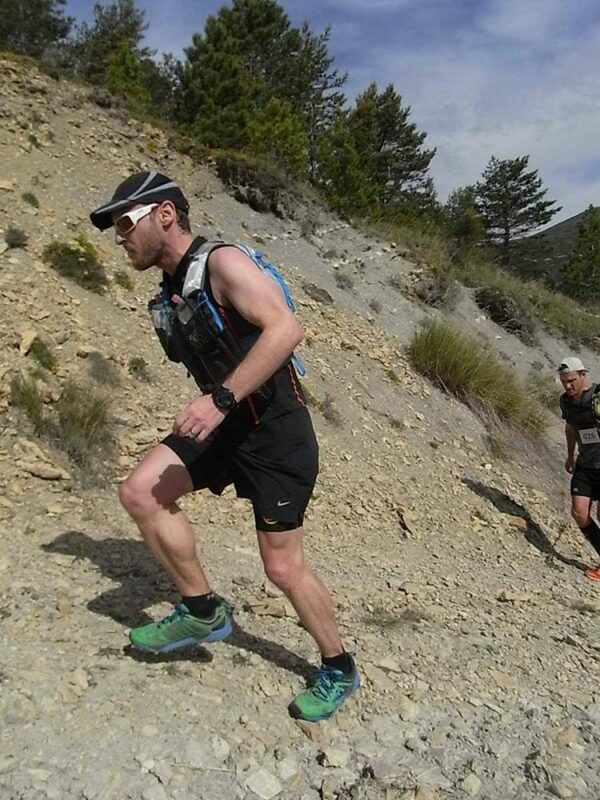 The weather forecast predicted a fine morning with possible thunder storms in the afternoon, and the morning did turn out to be perfect running conditions, and after 8 hours I’d reached almost 50km into the race and got three or four major climbs out of the way. Just after mid day, at the highest point of the race, the heavens opened and huge globs of heavy rain came heaving down. 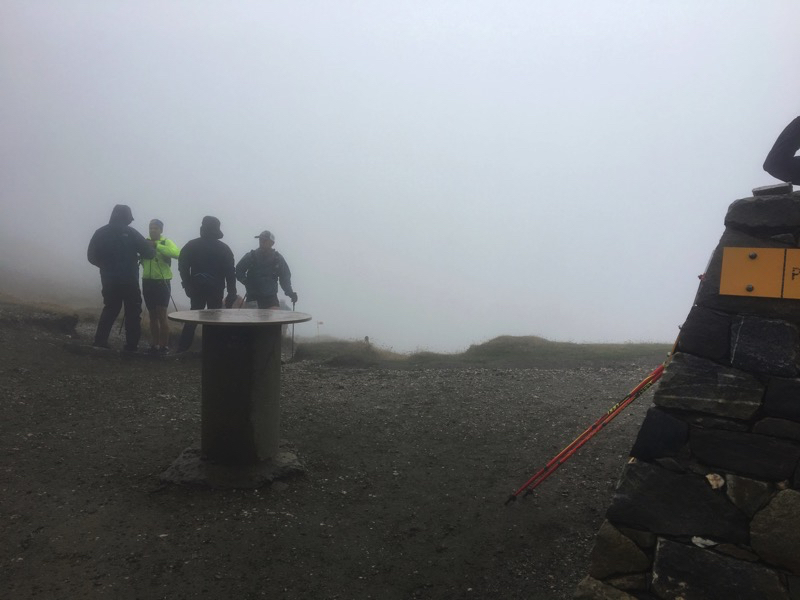 This was quickly followed by enormous cracks of thunder and lightning – being on top of the highest mountain in the area was quite a terrifying place to be so I headed into the descent as quickly as possible. Although we had clouds and thunderstorms the temperatures were still in the high 20s so a chance to cool off in a stream was very welcome. Although I had a rain jacket, the undergrowth was suddenly so wet, that my feet and shorts were soon soaked from running through the bushes on the way down. At the bottom of the descent, which took maybe 90 minutes, I found myself in Remuzat, site of my hotel, and making my way into a barn to a loud round of applause (as all the runners got) from the assembled volunteers. The barn was dry and warm, so I was able to at least change into a pair of socks from my pack, although they were pretty wet anyway. 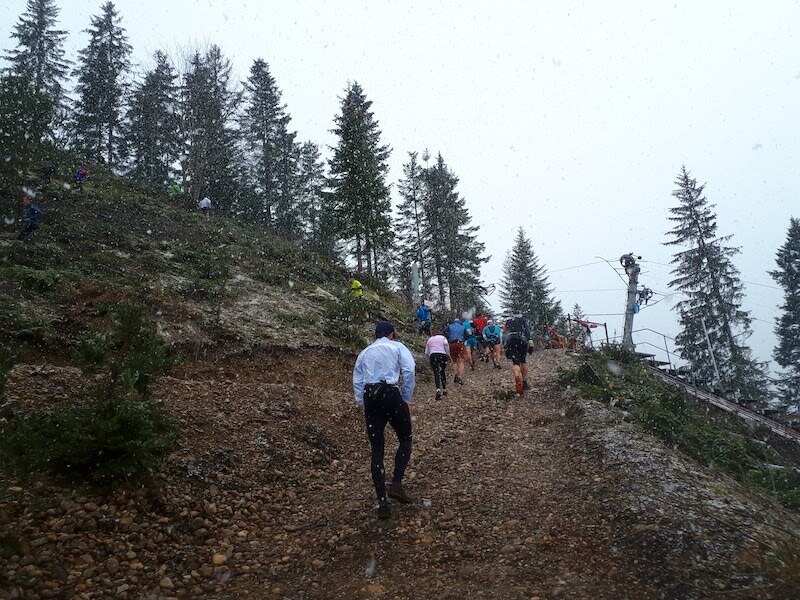 The organisers were holding back the runners because the ongoing storm was making it dangerous to head up the next mountain. 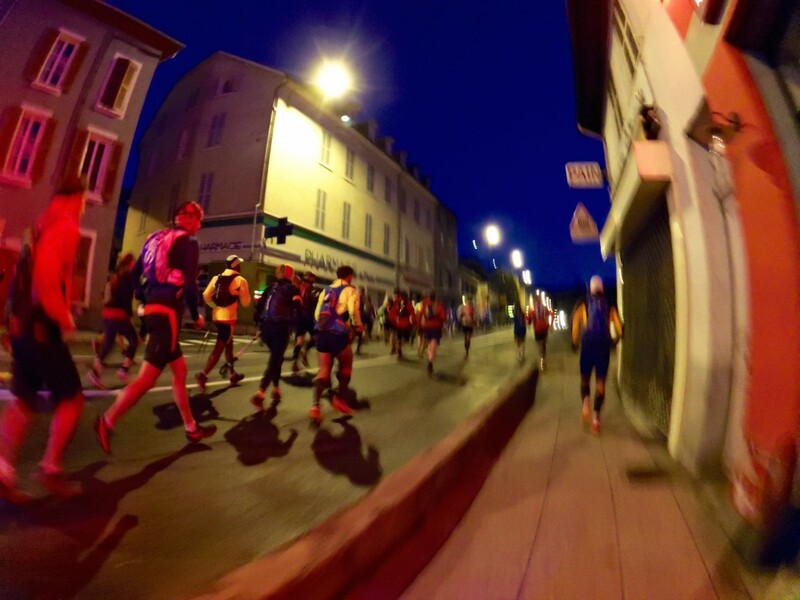 We could hear lots of sirens as the gendarmes and fire service rushed by in the street outside – although I don’t believe it had anything to do with anyone involved in the race. By this point I was starting to feel very sick. I really didn’t want to eat, and had barely eaten an energy bar in the last two hours. I forced myself to drink some of the noodle soup but that was about all I could face. After 20 minutes or so we were given the all clear but I think I wouldn’t have been too upset at that point if the event had been cancelled. The rain had stopped and the sky seemed to be brightening up, although there were still distant rumbles of thunder. Getting moving again was difficult – I was cold and shivery and couldn’t get moving smoothly – my limbs felt stiff and the run along a river bank trail was difficult to get back into the swing. 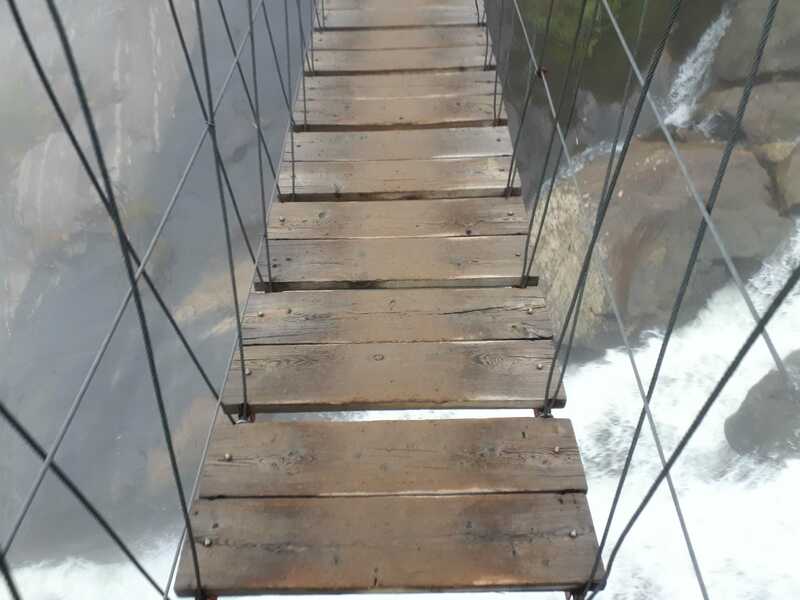 Even worse was to come – the ‘trail’ moved sharply upwards, following the route of a waterfall. Streaks of orange paint showed the way, because we weren’t following a trail for most of the time but were simply crawling up slick rocks. A couple of sections had via ferrata wires or fixed ropes in place and were necessary as losing your step could have ended badly. Some sections even had fixed ladders, but the rest of it was steep, stepped, slippery rocks. Finally topping out on an undulating plateau, were still picking our way through slick rocks which made running difficult and dangerous and I cursed the organisers several times. However the biggest problem was that I was simply bonking – I’d taken on so little fuel in the last few hours that I was in danger of not being able to reel it back in. I sat down on a rock and had a little word with myself – forced down an energy gel and almost vomitted. I think it would have been better if I had. That was basically the pattern until at around 10km to go, I got to the final aid station. 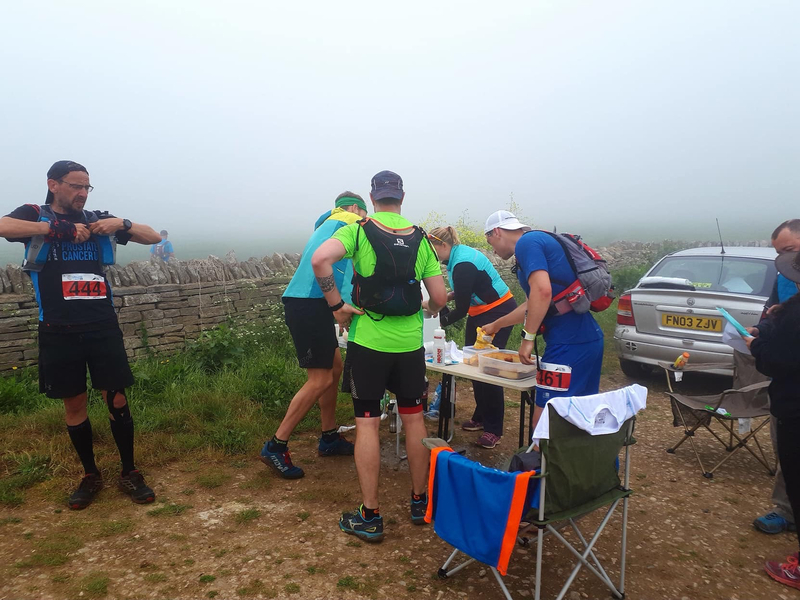 A bit more magic soup and some words of encouragement from the organisers and were back out for what should really be a simple 10km, mostly downhill run to the finish. Although my energy reserves were sapping at this point, I actually found the downhill single track quite easy and fun, and was able to keep a good pace, catching a few groups in front who had been way out of sight earlier. However we ran through some very claggy fire roads and the clay-like mud stuck to the soles of my shoes and wouldn’t shed, adding a lot of extra weight just when I needed it least. 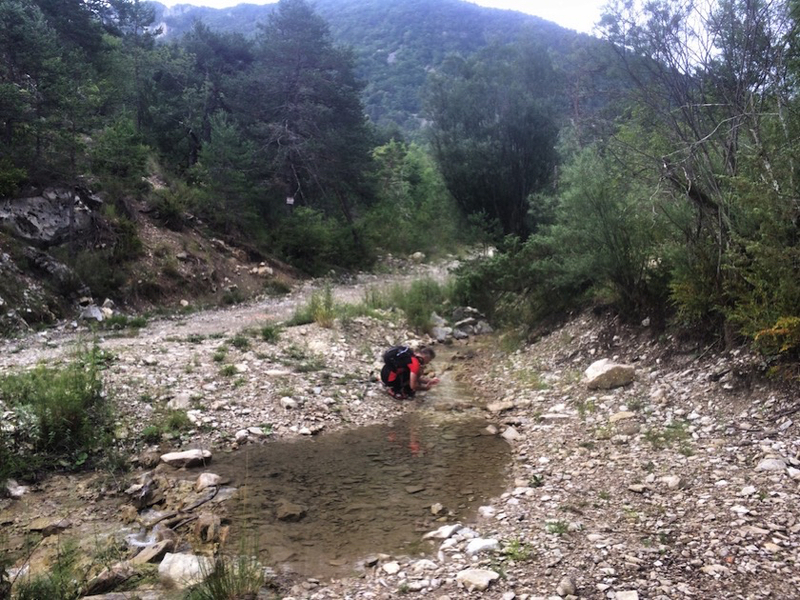 Descending back towards La Motte Chalancon, there were a couple of (by now very swolen, fast running and silty) river crossings and a what seemed like never ending run through the streets of the town. Just before 7pm I made it across the finish line with a time of 14:58:06, getting 44th (out of 84 starters) place. 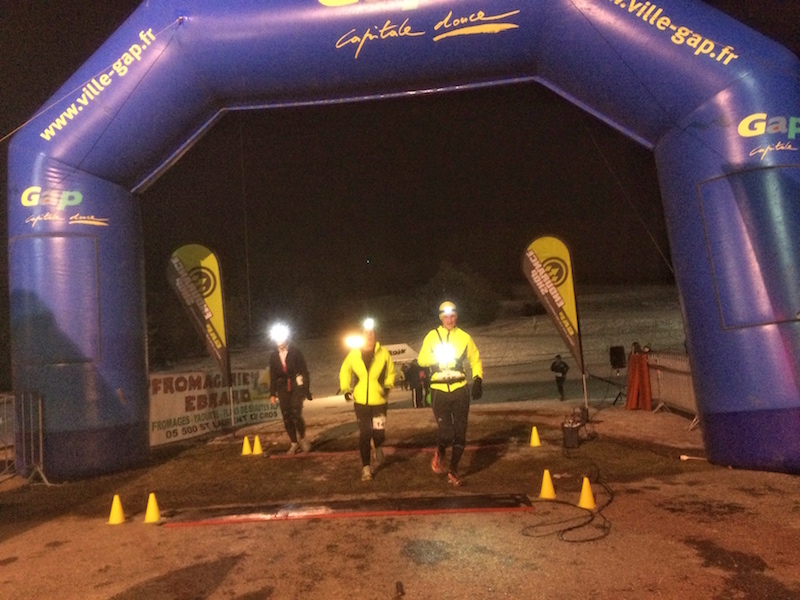 A small ceramic medal, and a finisher’s gilet were awarded at the end, and a complimentary meal at a local restaurant was available, although was so cold and tired at the end I just headed back to my hotel. Overally this was a great race. 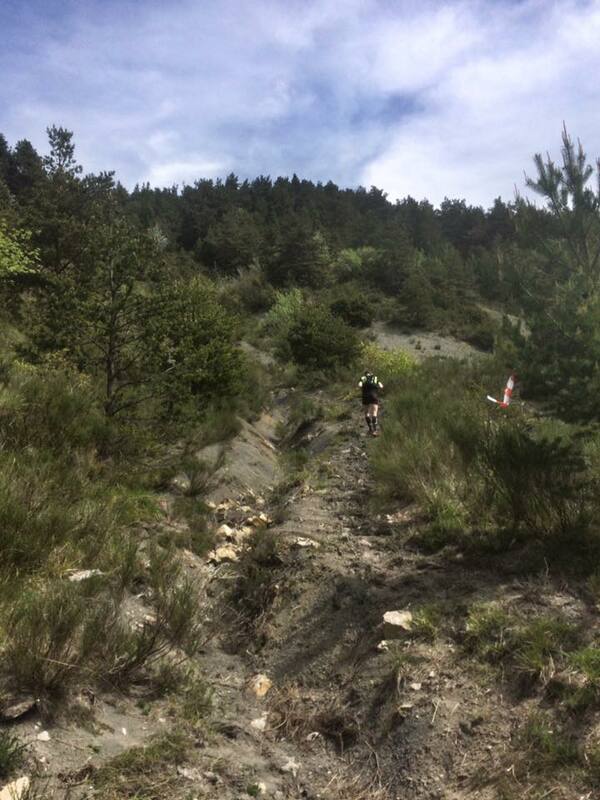 The course was challenging with some exceptionally steep climbing in places. 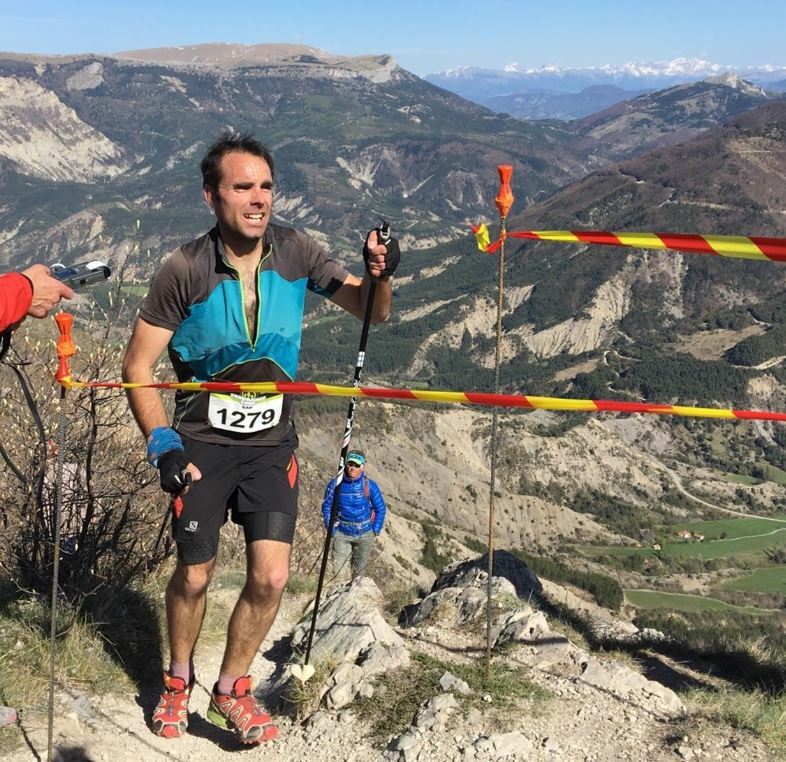 The organisers and volunteers were superb as is always the case with French races and the scenery is breathtaking despite being spoilt somewhat by the weather. 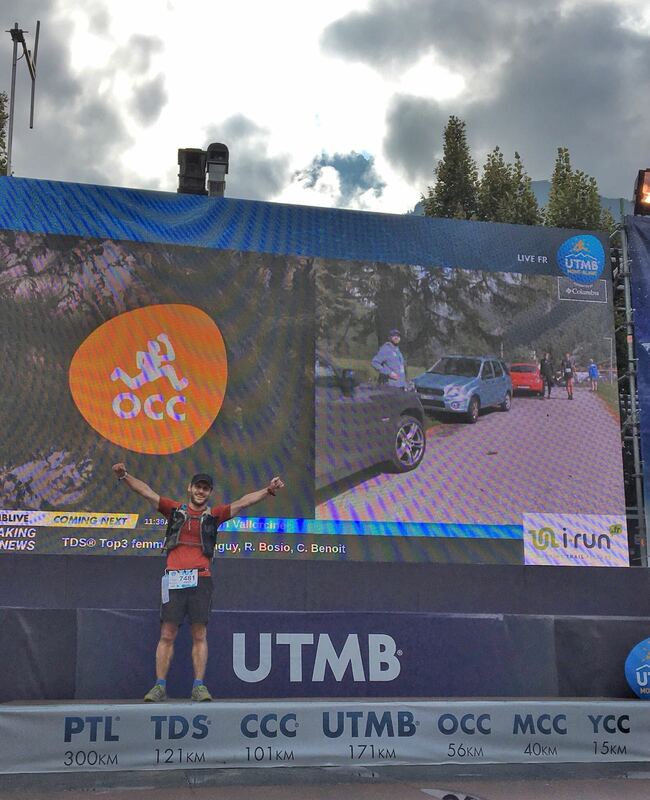 On top of that, the race was worth 3 of the old style UTMB entry points (or 5 of the new ITRA points). I would definitely do the race again although there are so many other events on my bucket list that I’m a bit spoilt for choice. 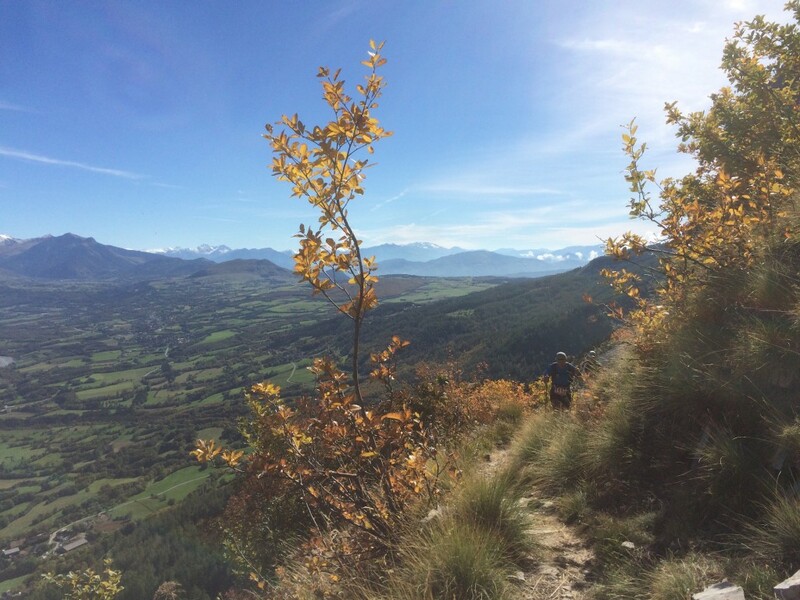 The Trail des Cimes du Buëch is now in its third year, and I had ran the 2014 and 2015 versions which comprised of a quick 17km circuit with some amazing views. 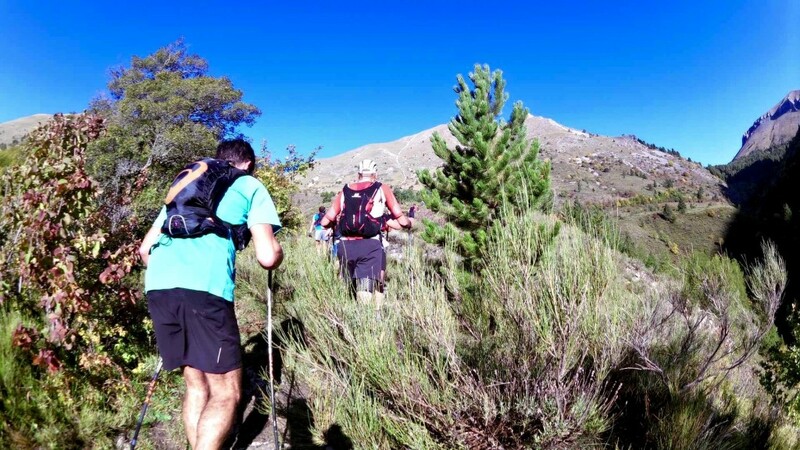 This year the 17km version was included in the Challenge Trails 05 competition, but on top of this was added a 42km mara’trail event with nearly 3000m of climbing. I entered the event at the last minute because I’ve been recovering from a torn calf muscle which stopped my training for around a month, so I was keen to take this one easy and use it as a test to see how much fitness I still had left. 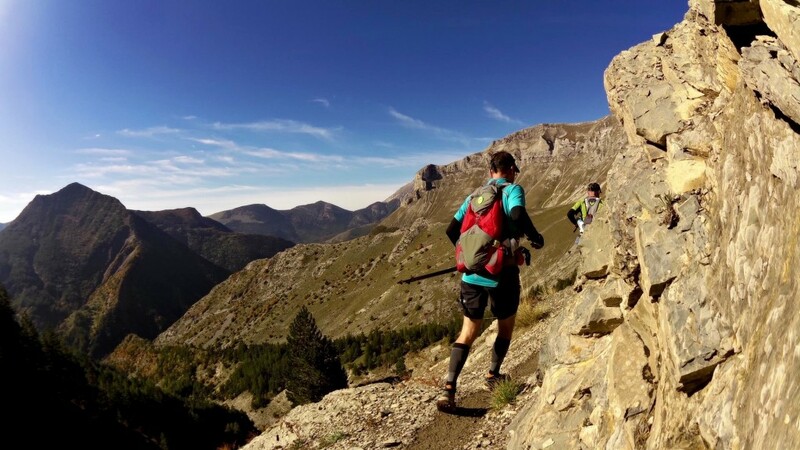 The first third of the race takes in most of the original 17km, and I know from experience that its a hard climb, although rewarded with some amazing panoramic scenery. The latter stages of the race are also pretty hilly though so I was careful not to go out too fast. 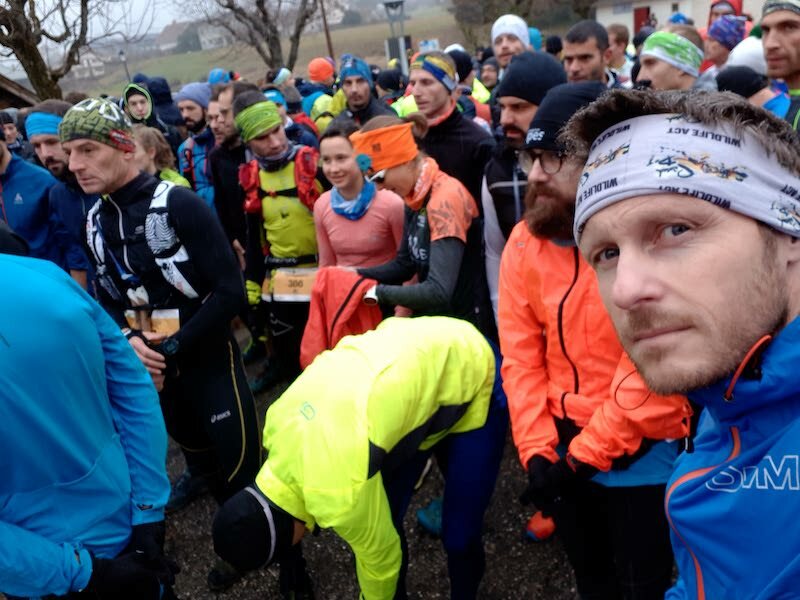 Only 38 runners lined up at the chilly start, but there was a good atmosphere and pretty soon we were off. The tough climb at the beginning was everything I expected, followed a by a rocky, technical descent. The weather was warm and sunny, but as the race went on the wind really caught up. The photo above shows a climb about two-thirds of the way in and an enormous wind blowing from the south was actually blowing me off my feat as I climbed up onto the ridge. My cap had to be lashed to my trekking poles otherwise it would be half way to Lyon by now. After 35km I was starting to flag, but the last climb although not the biggest definitely felt the toughest. After a hot and tiring climb the descent off the other side was technical and very tough on the legs. Back down in the forest on the final run in. Cheese and Coke at the finish. 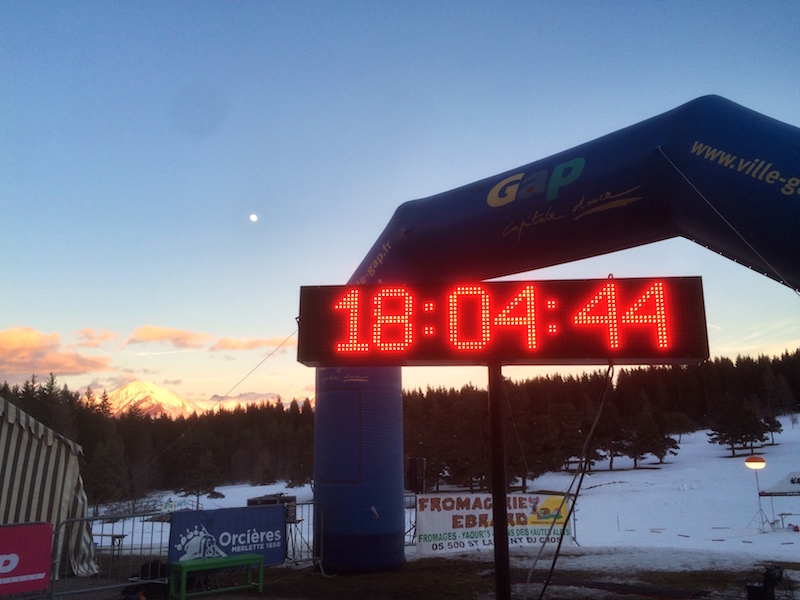 With the exception of ultra marathons with early starts/late finishes, I’d never really done any night racing so I was looking forward to this evening trail race on the snow trails of the southern French Alps. I had some eye surgery at the beginning of the year which meant I had to take it easy on physical exercise for a few weeks. 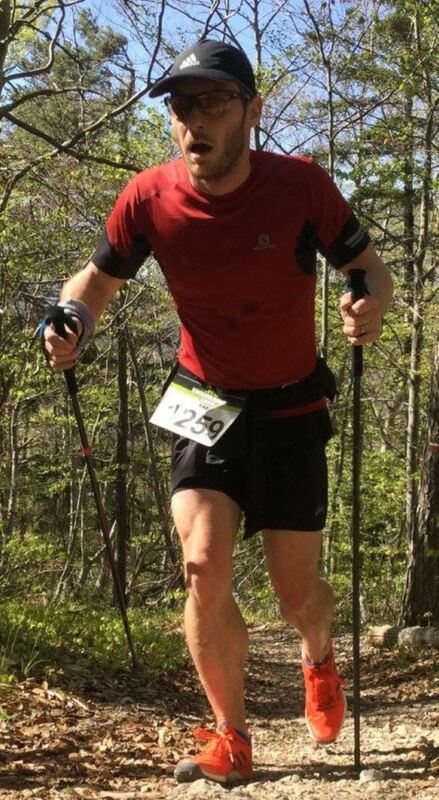 The upshot is that I’m only getting back up to fitness and so I wasn’t expecting great things in the first race of this season, the Bayard Trail Snow Race near Gap. My pre-race warmup, consisting of standing around the firepit chatting to my mate Manu. I’d also forgotten how hard racing was. 90 minutes of full one exertion with no opportunity for micro-rest like on training runs where a little fiddle with your shoes, or a drink of water gives you a small chance to get back some breath. 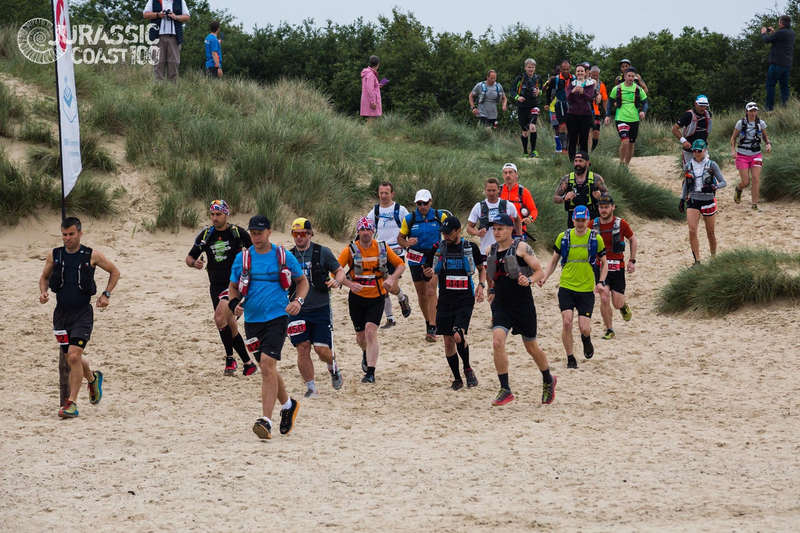 This was the first edition of the Bayard Trail and its part of the Challenge Trails 05 events that I competed in last year so I fancied getting stuck in, especially since my goal this year is to run longer stuff so I might do less of the shorter, sharper races. To be honest the organisation wasn’t the best – first of all despite having registered online a few days before, I had to queue along with all the people registering on the day. Why don’t race organisers (I know some do) have separate lines for ‘on the day’ entry? Anyway, because of the enormous lines (I think there were around 150 racers) the start of the race was delayed 20 minutes. Luckily there was a huge fire pit to keep warm by as the sun dropped and the full moon came out. Eventually we were ready to race – the course consisted of two loops, with one of them done twice. 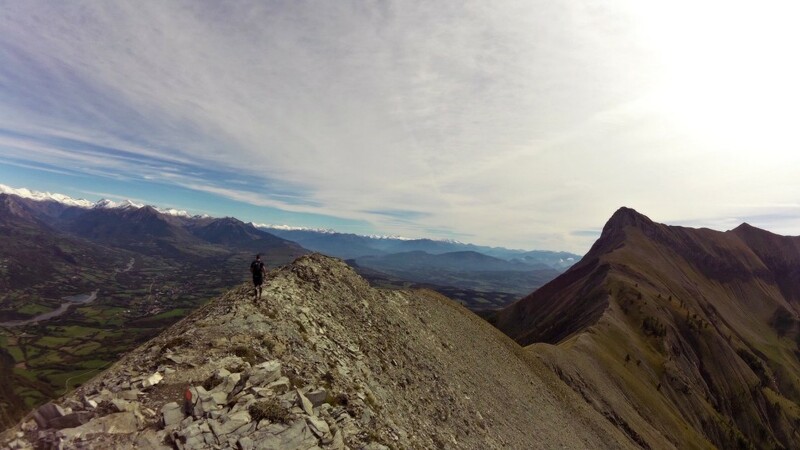 The total distance was around 16km with 400m of vertical. It was undulating rather than steep with some quite punchy changes in gradient that made it difficult to keep a rhythm. Upshot, it was tough going. After the typical fast jostling for a position at the start I settled into somewhere around a third of the way down the course and pretty much kept position, maybe losing about 10 places around the duration of the race. The biggest thing that struck me was how little scenery you see. Despite being entirely on snow, with clear skies and a full moon, using a headtorch meant my night vision never got established and all I ever saw was the trail a couple of metres in front of me. 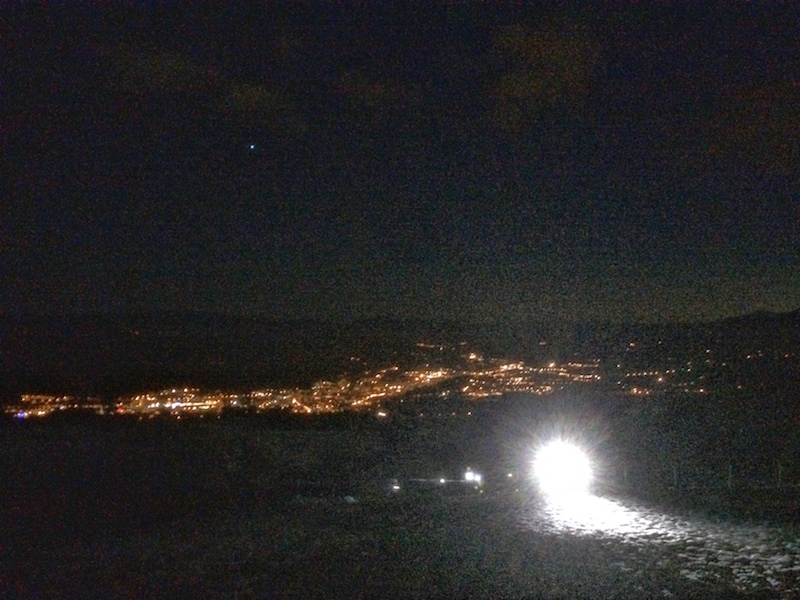 There was a nice view over the town of gap, with the city lights twinkling in the valley below, but for the most part it was a fairly monotonous race. At least the race meant I got some points in the bag for the Challenge Trails 05 competition. There were a couple of ravito stops during the race but I never took advantage – at the end however was a bowl of the hottest noodle soup I’ve ever had in my life. I almost didn’t get to run this race. As you may or may not know, the French insist on seeing a signed medical certificate from your doctor before allowing you to race. Every year I go to my GP, she checks my pulse and blood pressure and then signs my note. 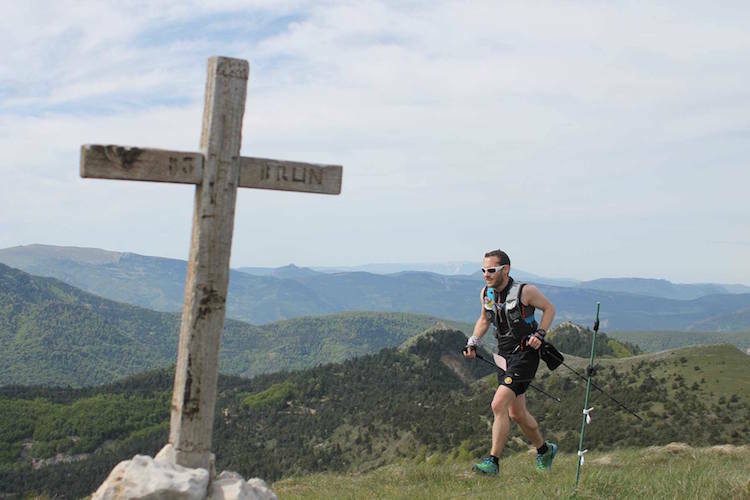 It lasts for a year and I can supply photocopies to race organisers with no problem – in fact I’ve run 8 races in France this year with the same form. GAPENCIMES 2015 from AIR libre on Vimeo. The Gapen’Cimes series of races took place over the weekend of 3rd/4th October, with the 55km/3000m Edelweiss race being on the Sunday. Since the race would start at 6.30am, and the start was at least an hour from my home I decided to pick up my race bib on the Saturday, since we had to be in the city of Gap, where the start/finish was, anyway. 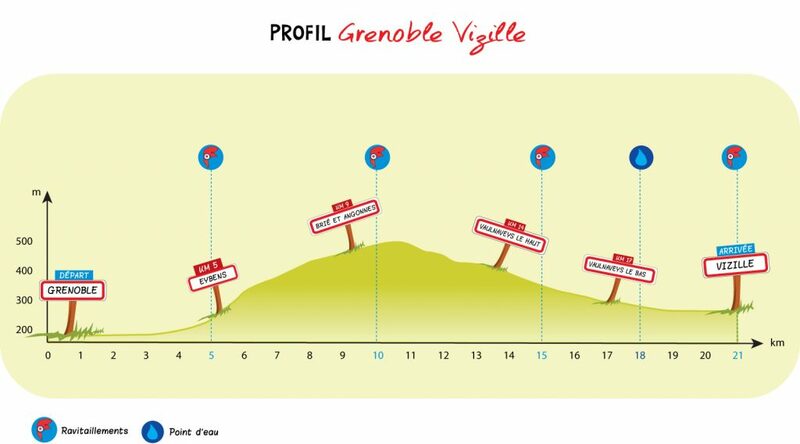 The course profile – pretty lumpy with the climbs getting progressively higher. When I went to collect my race number I was told that the regulations had changed, and my medical certificate had to explicitly state that not only was I am fit to run a race, but that I was fit to run ‘in competition’. Sadly, my certificate didn’t say that. It was only after the race staff tracked down my doctor, and had her email them an attestation that I would be OK, that they would let me enter. If I’d left this to 6am on Sunday morning I wouldn’t have had chance to do this, so I’m very glad I decided to try to save myself some time. On Saturday afternoon the south of France was being deluged by huge storms, some of which sadly claimed the lives of several people down on the Mediterranean coast as tunnels and underground carparks were swamped and people were washed away by flash floods. Up in the Alps things weren’t quite so bad, but the rain was torrential and violent lightning storms flashed and rumbled long into the night. It was announced that although the weather would be fair on Sunday, the route would altered as many of the trails had washed away and for the safety of runners and marshals, some of it would have to be rerouted. The race start was also postponed to 7am. I woke up on Sunday morning thankful to not hear the rain pounding on the windows. Driving towards Gap, there were still lightning flashes in the distance but thankfully it stayed dry. 300 runners assembled in the Parc de la Pépinière, in the centre of Gap. The pre-race briefing explained that the new route wouldn’t add any significant distance to the expected 55km, but to groans from the crowd of runners it was announced we would have an extra 300m of vertical to climb on top of the usual 3000m. A quick gear check, countdown, and we were off. Running the through Sunday morning streets of Gap (a small town of perhaps 30,000 people, but one of the largest towns in the area) to the occasional applause and encouragement. 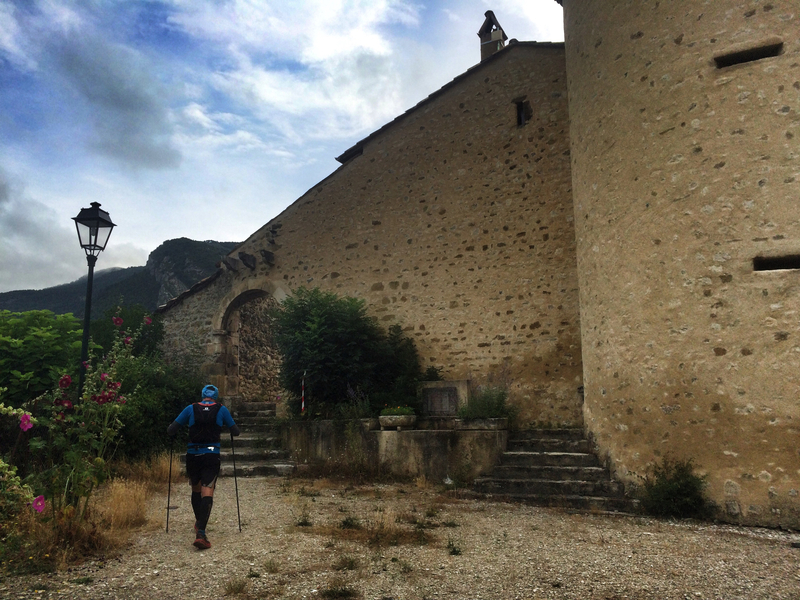 The local police were holding the (admittedly light) traffic to allow us to run unhindered to the outskirts, and after a few KMs we were on trails heading up to the mountains of the Haute-Alpes. 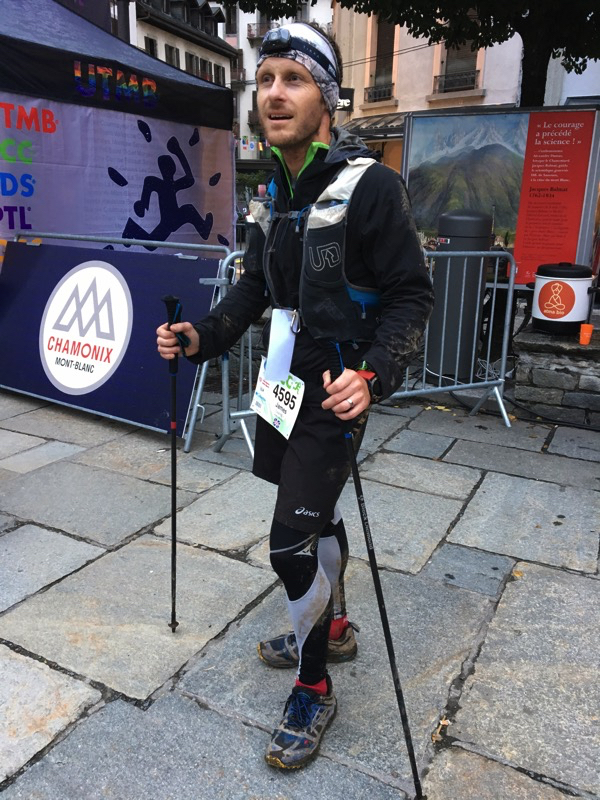 For this race, and for the first time ever I was using a pair of trekking poles (or cheating sticks as they’re rather sneeringly referred to in the UK). I’ve never really used them before, but for the next couple of years my aim is to bag a few more ultra distance events with a view to getting to a 100 miler. I’m not sure if the use of poles made a positive difference but they certainly weren’t a hinderance. I’d say that at least 70% of runners were using poles, and since we’d had so much rain the many streams that we had to cross had been transformed into raging torrents, they were a big help when crossing. The first couple of streams, we were able to gingerly pick our way over the rocks, but our feet still got soaked so myself and many others decided it was better off to just run through, get the feet wet and hope they dried out in the sun. 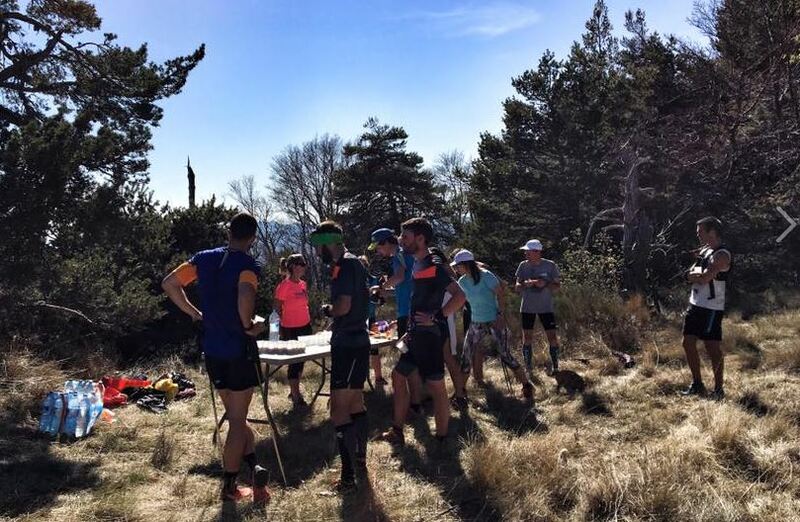 The first checkpoint at Rabou came at about the quarter-way stage – there weren’t many food stops, but they had the standard French trail running fare – cheese, salami, ginerbread cake, chocolate, apricots, crisps, bread flat and fizzy water and Coca-Cola. I availed myself of the food, cleared some grit out of my wet shoes and got moving. 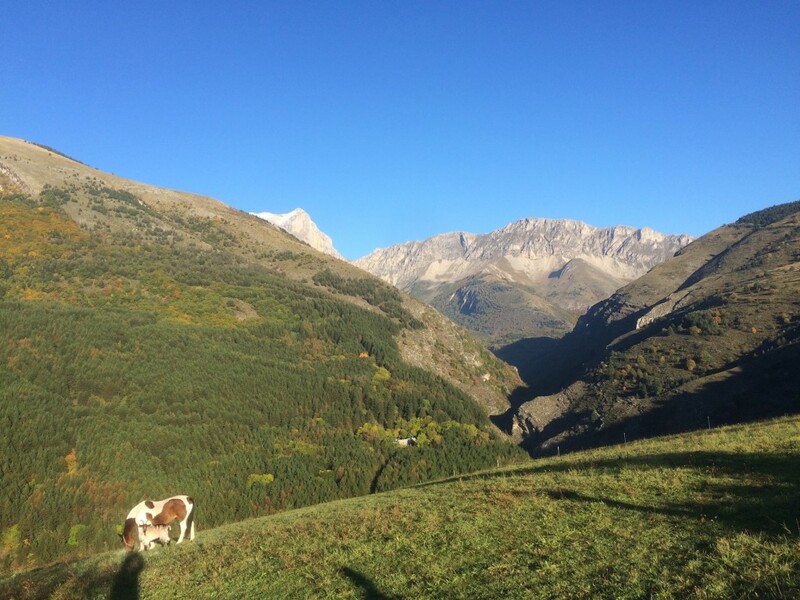 As we left Rabou, we climbed higher into the mountains and sun came out – the surrounding countryside was awash with autumn colours and to the northeast we could see the high mountains of the Ecrins national park, and the recent dusting of snow that must have fallen in last night’s storm on some of the lower peaks. To be honest, most of the race was fairly standard. I deliberately kept myself to a sensible rhythm, aiming to dose out my energy over the course of the race and not blow up. 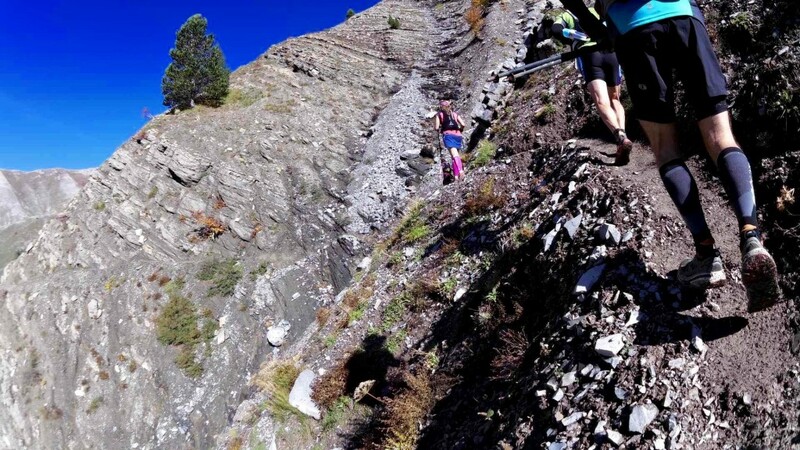 It was hard not to run some of the descents too fast though, as there were some great tracks, including a fairly kamikaze dash through a field of scree which was a lot of fun. By the time we made it up the final climb to a spectacular view, I was pretty knackered and little bit dejected at the final checkpoint when I asked a marshal how many had come though and he said “most, maybe three-quarters”. I was sure that I was still in the top half of the race even though things had definitely thinned out. Nobody was passing me in fact I had gained a place every couple of KMs. 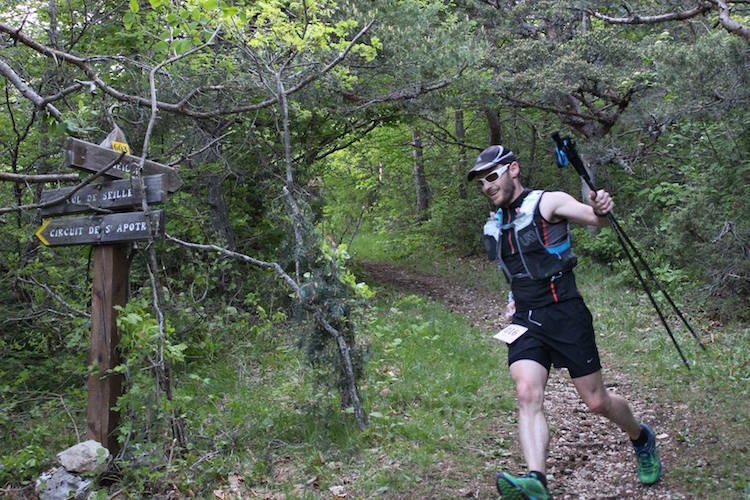 That final checkpoint was just 11km from the finish, and all of it was downhill on fairly easily runnable terrain. However it was the hardest point of the race, and running into the streets of Gap, despite the cheers and applause of random onlookers, and even encouragement from the police holding up the traffic, the run into the finish seemed to take forever. 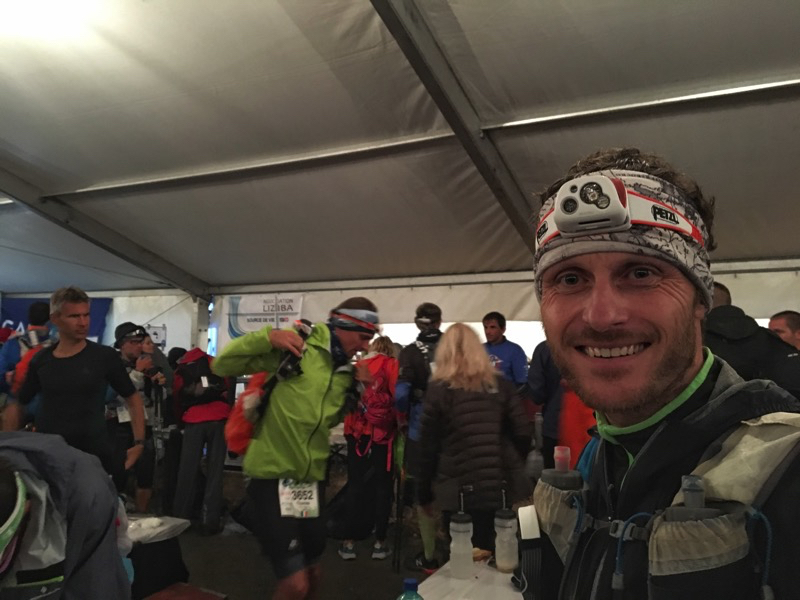 I made it over the finish line in 8h41’37”, placing me 138th out of 297 starters, so in the end was quite happy with a top half finish.